Today is Memorial Day in the United States. 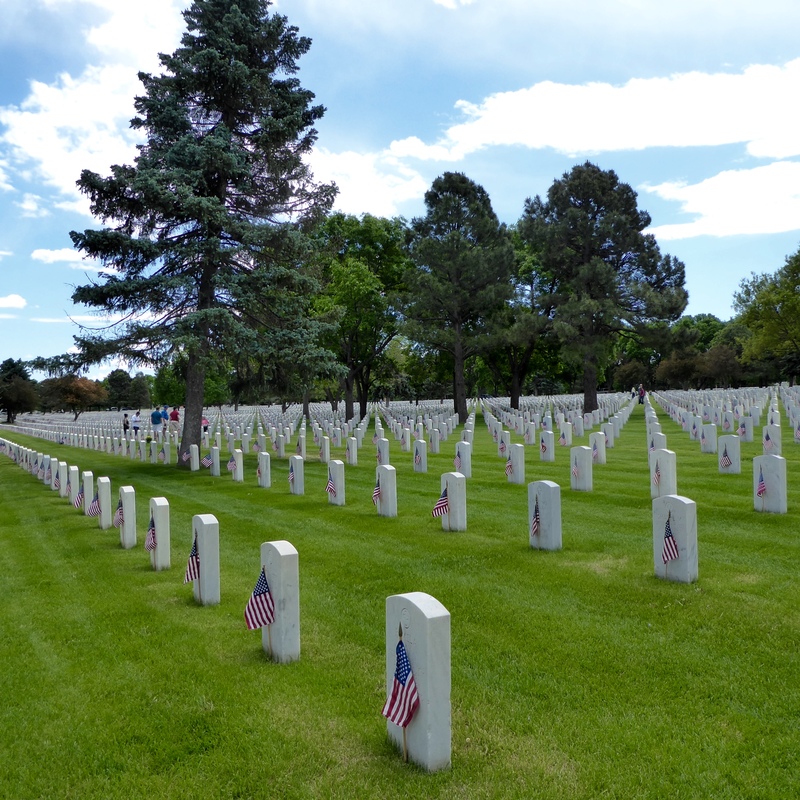 Memorial Day was originally called Decoration Day after the American Civil War. Since 1967 Memorial Day has been a Federal Holiday, celebrated the last Monday in May. This is the day for remembering the people who died while serving in the United States armed forces. 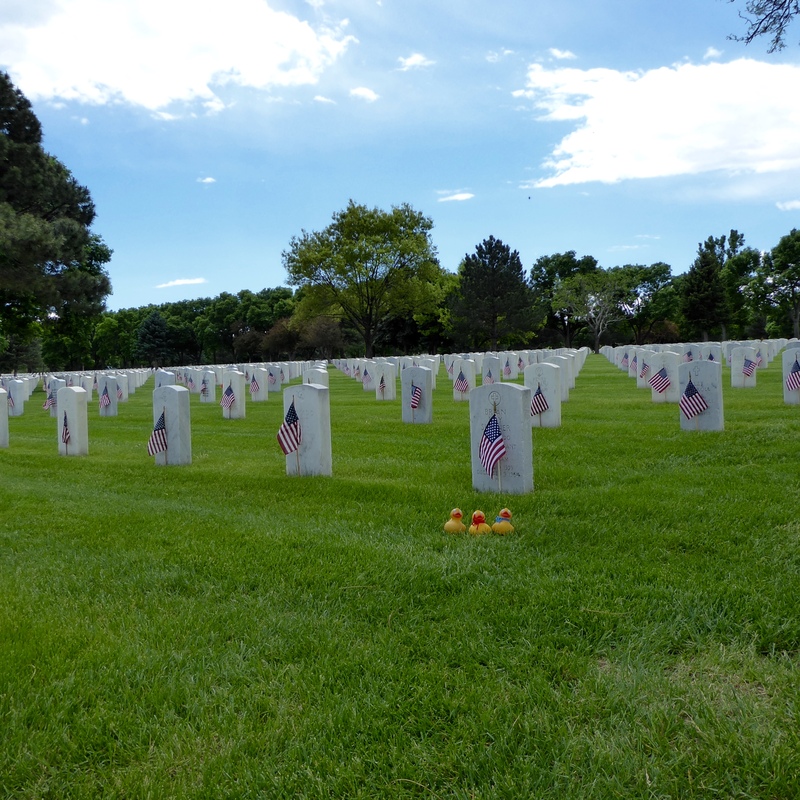 We drove to Fort Logan National Cemetery in south Denver. This federal cemetery is 214 acres of white headstones and was opened in the late 1800s. Volunteers placed American flags at all graves. There are more than 100,000 small American flags there today. 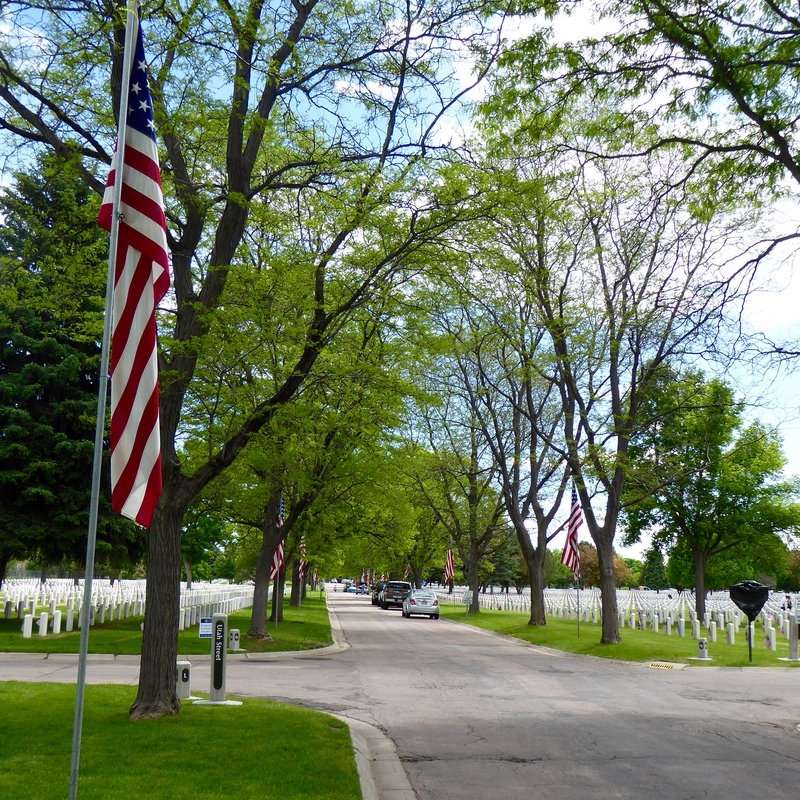 The roads leading into the cemetery are marked with larger American flags. 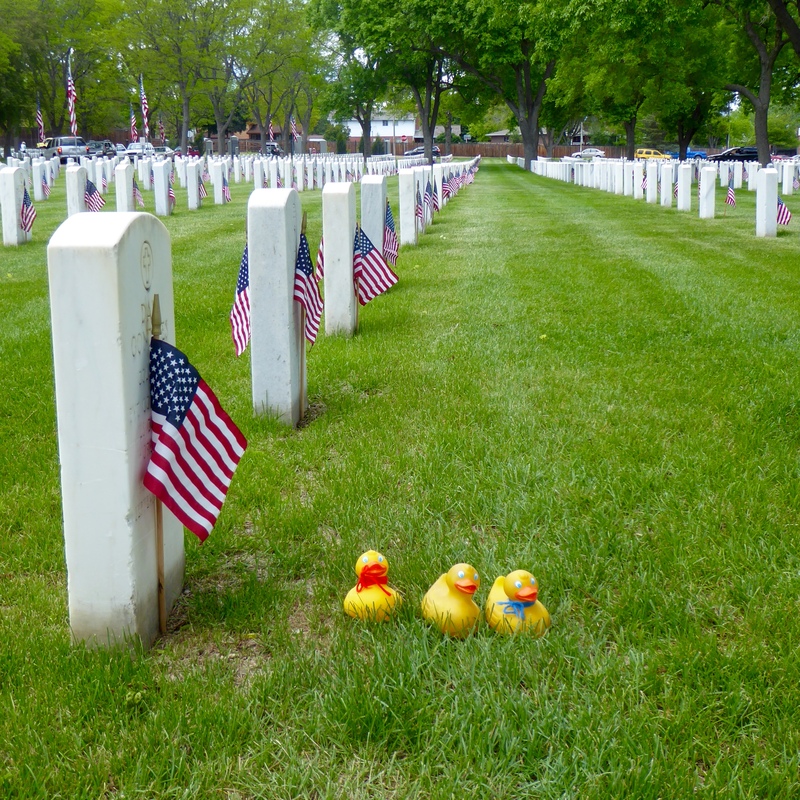 We, the Colorado Traveling Ducks, remember, honor and are forever indebted to those who gave their lives to give us our way of life. 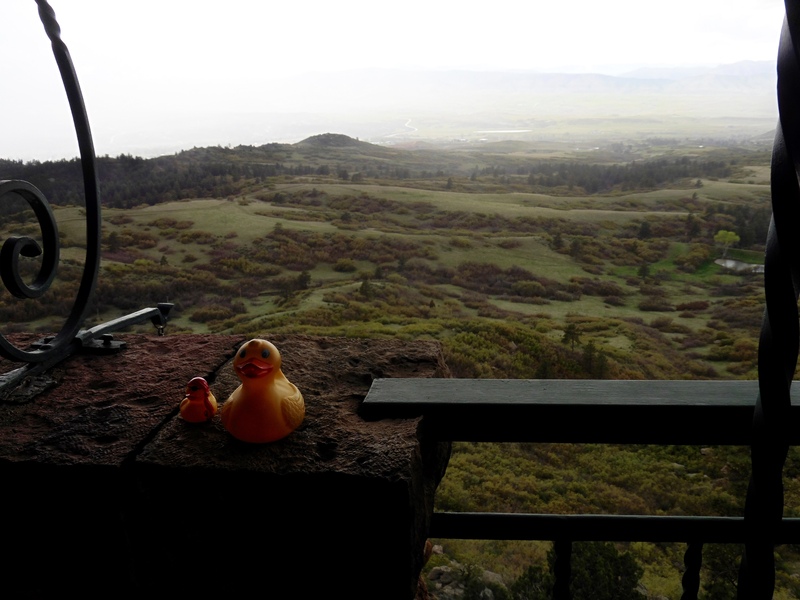 We are proud to introduce the newest member of our Colorado Traveling Ducks family. 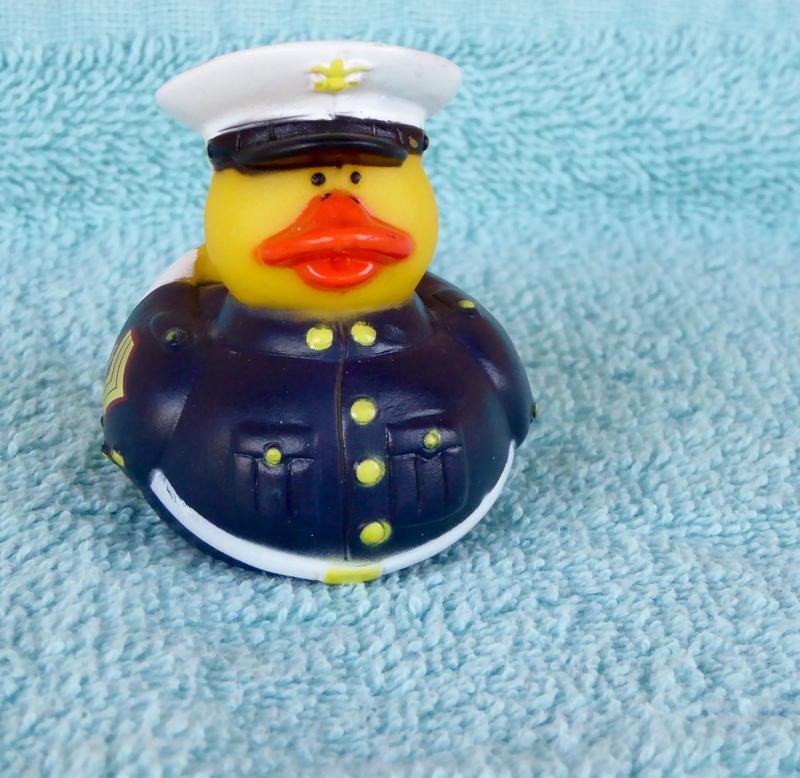 Joe the Marine Duck is in full dress blue uniform. 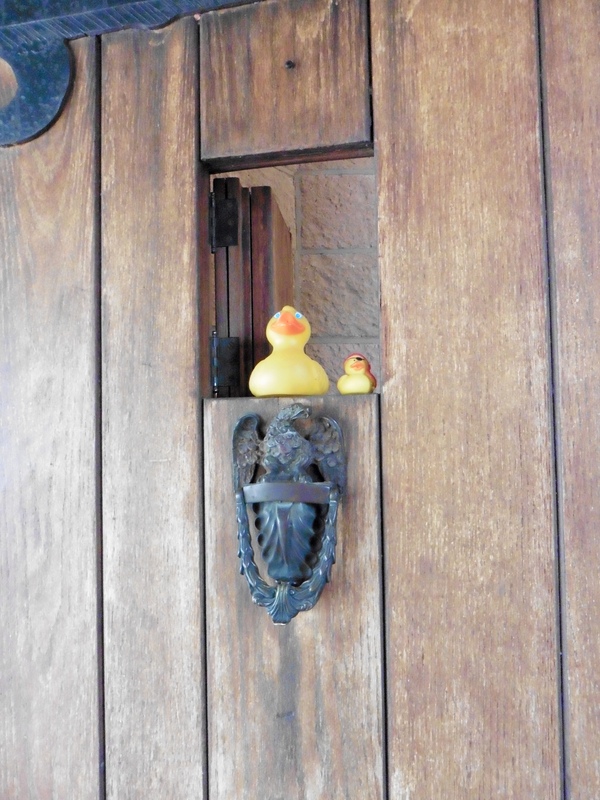 You remember our friend, Ms. Ducky. In January 2016 she told us about her trip to Europe and then a return European trip to Ireland. Her human brother is a United States Marine. We are proud of the Marines and all humans in the United Sates Military Service. Welcome to our new brother, Joe the Marine. 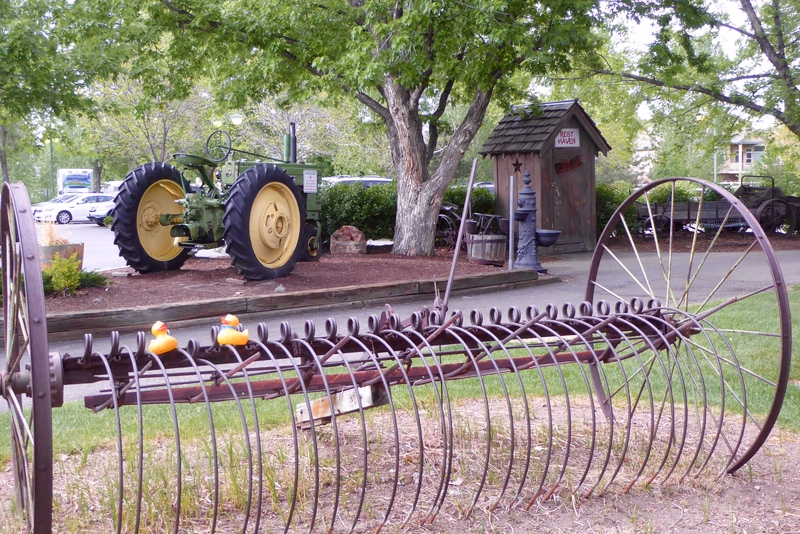 White Fence Farm is our favorite farm and one of our favorite restaurants. 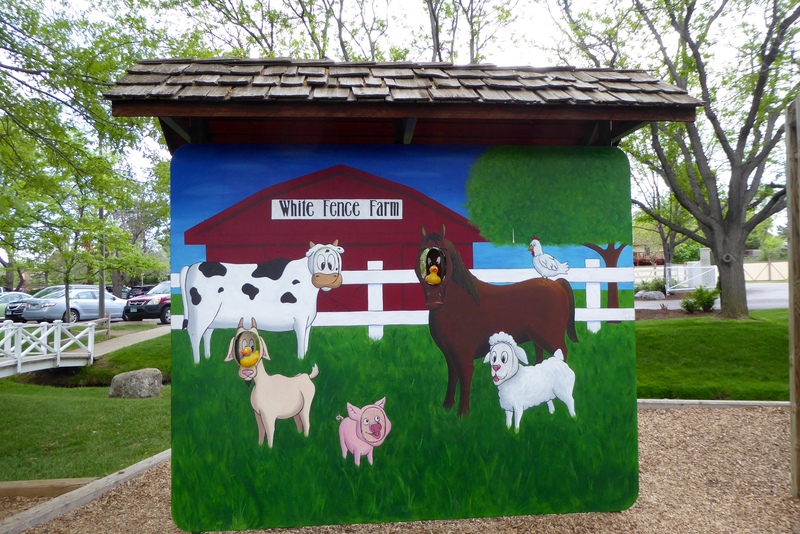 This is a real farm, with animals and more. But, let’s eat first. 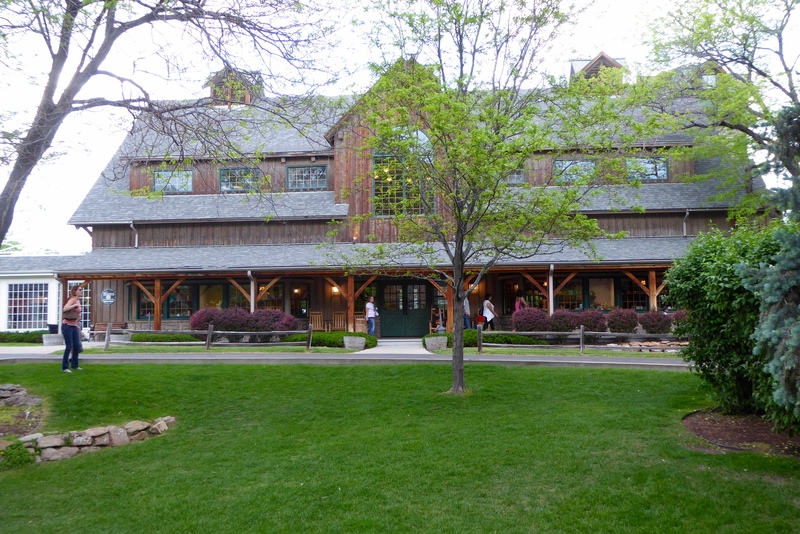 Front entrance to restaurant and farmhouse. 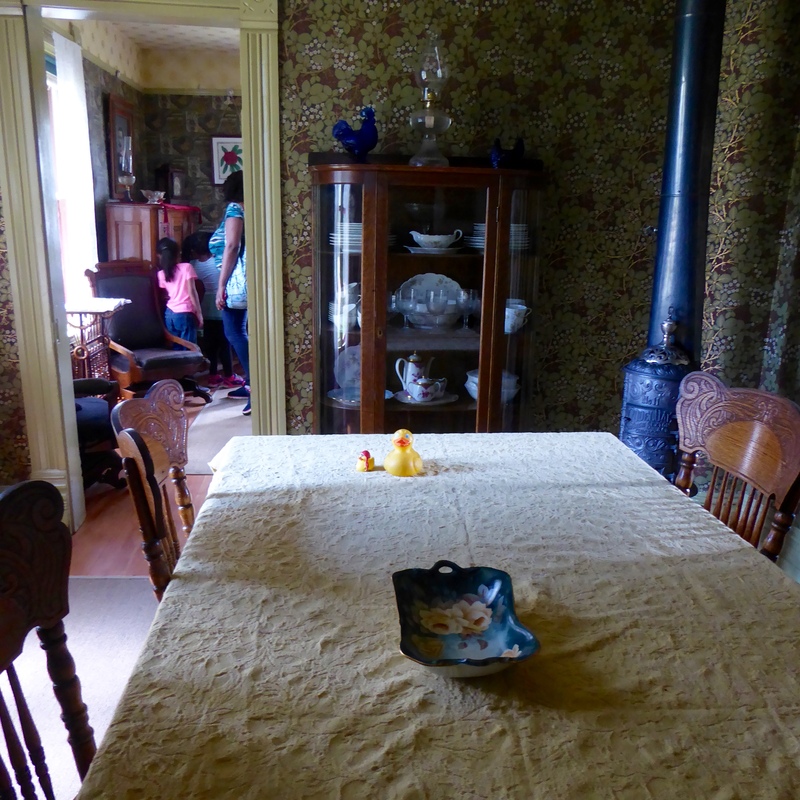 We enter the farm house and are taken to one of the many dining rooms. We get a great table, right by the window. It does not take long for our moms to order. The fried chicken here is famous and very tasty. Dinner here is served family style. Our side dishes arrive while our chicken is cooking. We start with kidney bean salad, creamy cole slaw, and pickled red beets. All are delicious, but the star of the side dishes must be the hot corn fritters. The remind our moms of warm donuts. We love them! Soon a platter of chicken arrives, with the potatoes. My mom ordered a baked potato. 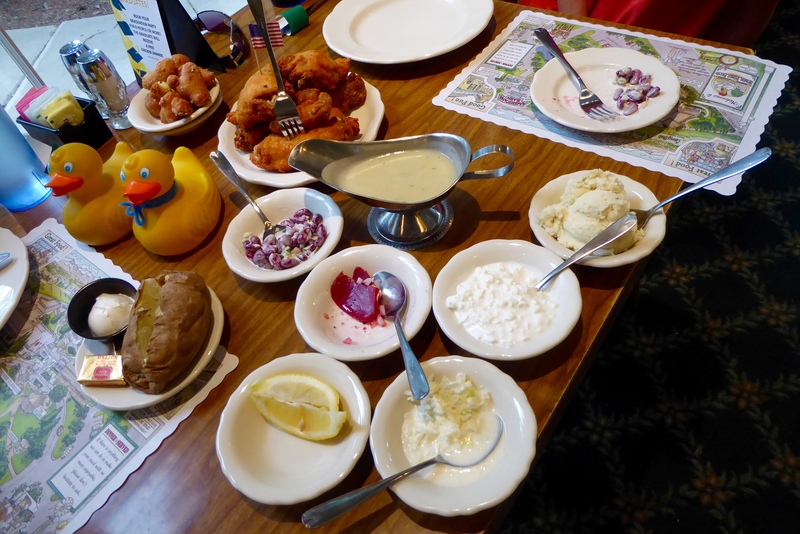 Soapy Smith’s mom ordered mashed potatoes. They look like ice cream, but the potatoes are perfect and wonderful. We are asked if we would like more of any side dishes. Of course we would! Because we can have as much of the side dishes as we want, we cannot take them home. But all of this chicken is ours. We eat a lot and still have plenty to take home. After dinner, we wander around the farm. The weather today is very nice, so we spend our time outside. Our farm has farm equipment, this tractor and of course, the outhouse. We prefer the indoor plumbing. Great carriage here. Isn’t this a great farm? This truck driver is our new friend. We like his truck also. This driver is our friend. 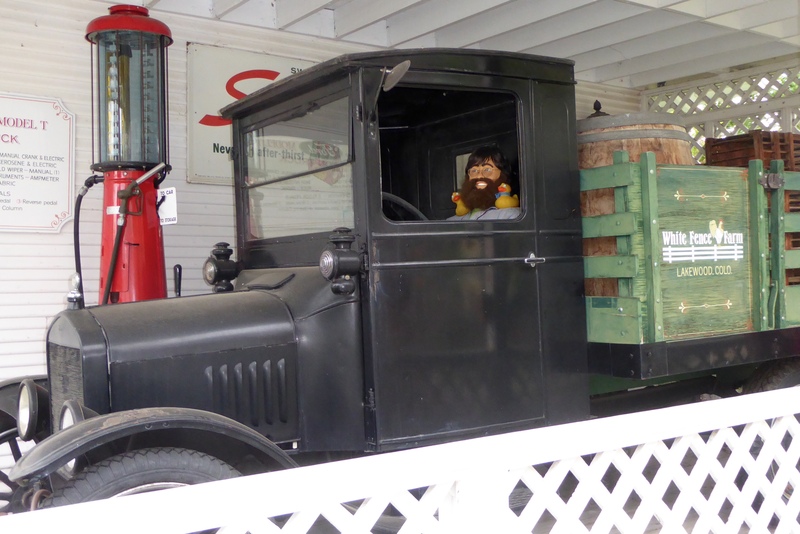 It is a 1925 Ford Model T One Ton Truck. When it was new, the price was $1,300. The roof of the truck is fabric. 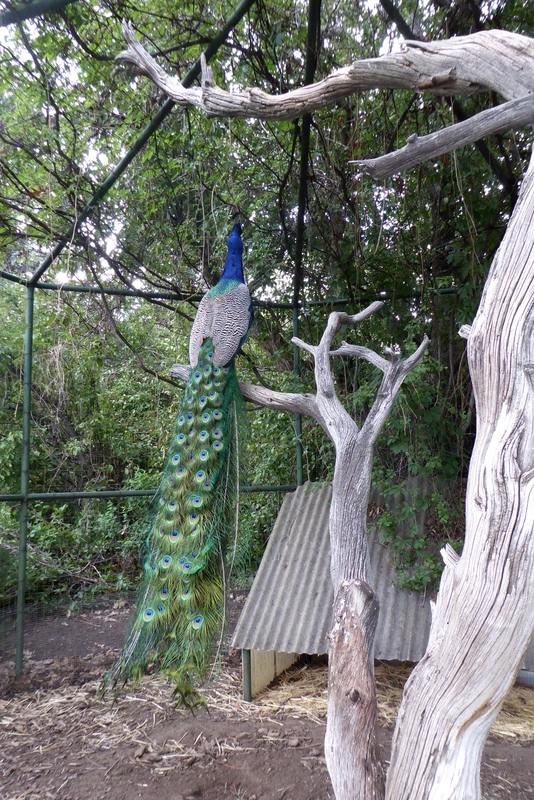 This farm even has a peacock. The blue on peacock feathers is such a brilliant blue. Soapy and I are enjoying our horse ride. We even have a human friend riding with us. These cut out boards are so much fun. Soapy and I have the bodies of farm animals. 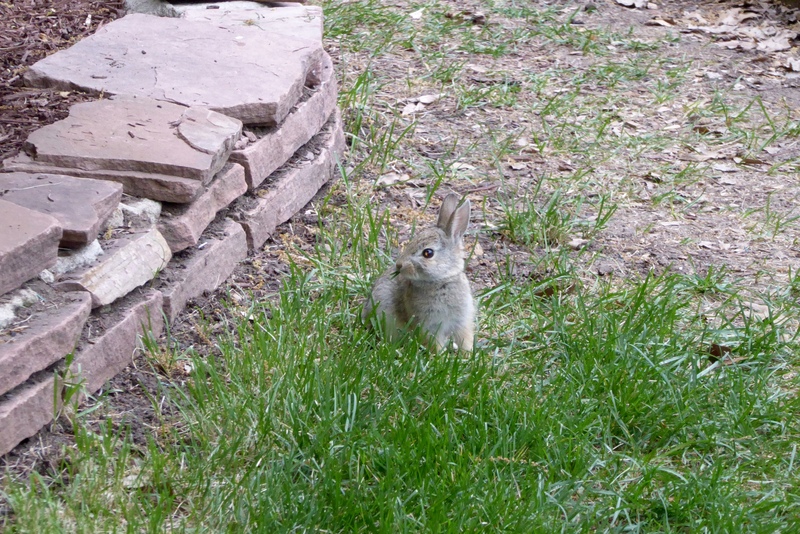 It is spring, and last week we had photos of baby pigs and baby geese, so now we have a young rabbit. We love small, young animals. The grounds of this farm are beautiful. There is a river, a pond, and everything is beautifully landscaped and well cared for. 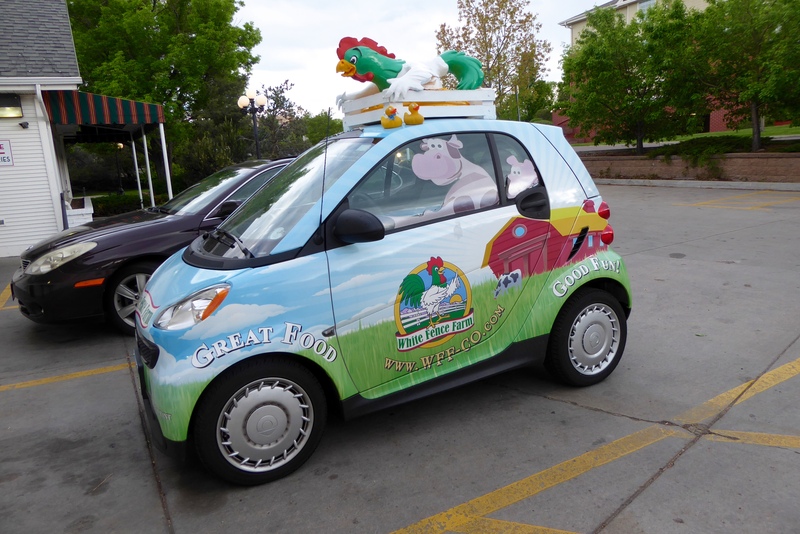 Look at this car. Definitely belongs here at the White Fence Farm. We love the area with goats. 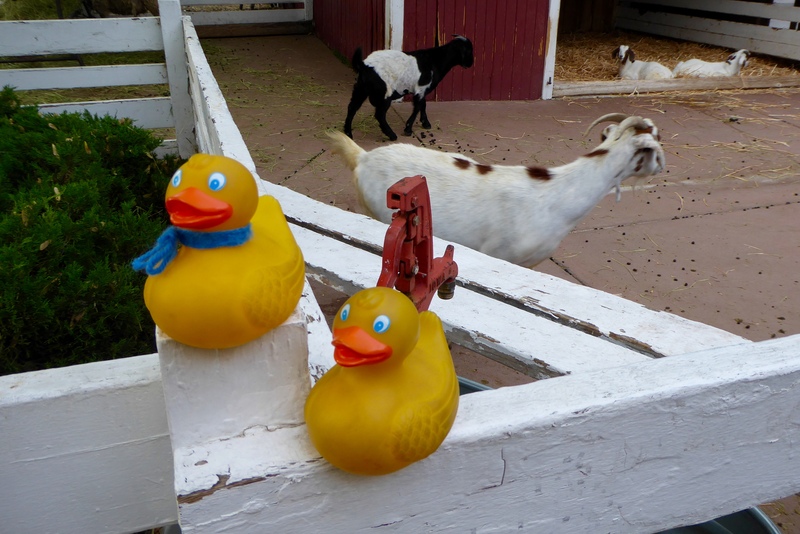 The humans put quarters in the machine and they get food for the goats and sheep. Everybody has a good time. 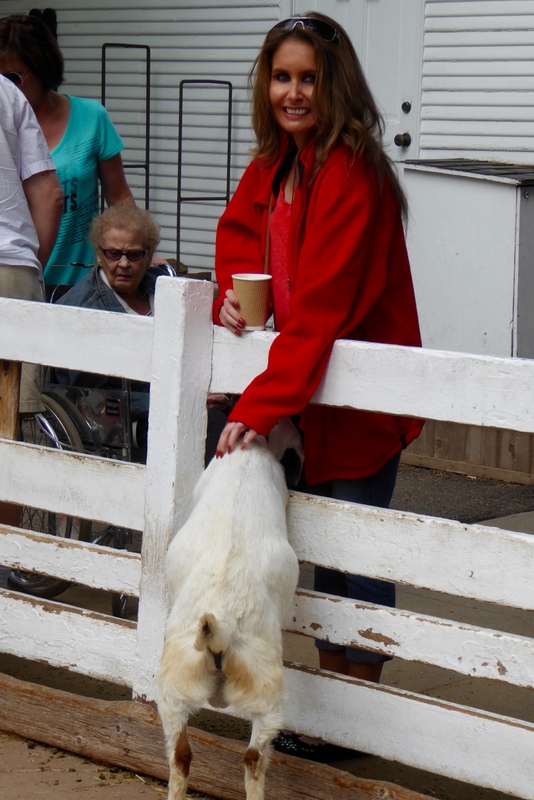 Soapy’s mom is feeding the goat. Now the goats are being fed by other humans, so mom thinks it is safe to put us on the fence. The goats are busy, so they won’t try to eat us. There are many other things to do inside, also. This is the Americana Barn. Americana Barn. 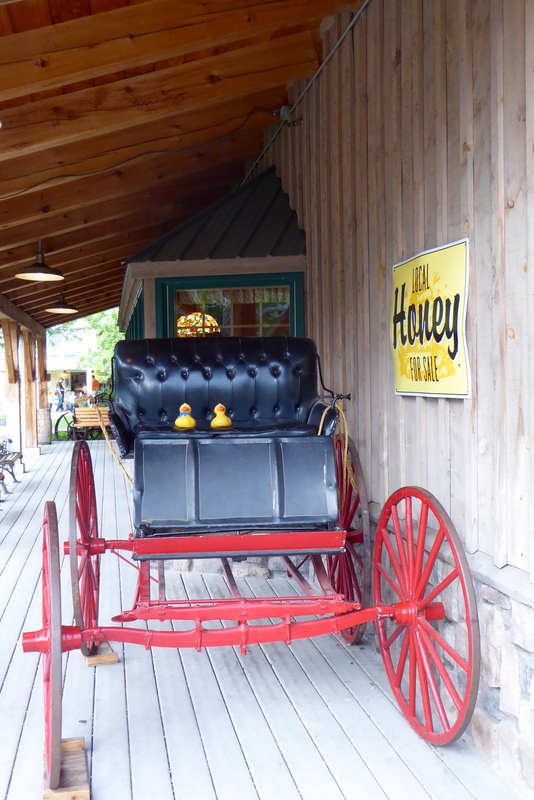 The barn is attached to the farmhouse restaurant. There is a stage and dance floor. Tables to enjoy refreshments. A nice gift shop and our favorite fudge and candy shop. Young humans can play on the two level tall slide. But, today the weather was so nice, we stayed outside, except for a quick visit to the fudge and candy shop. 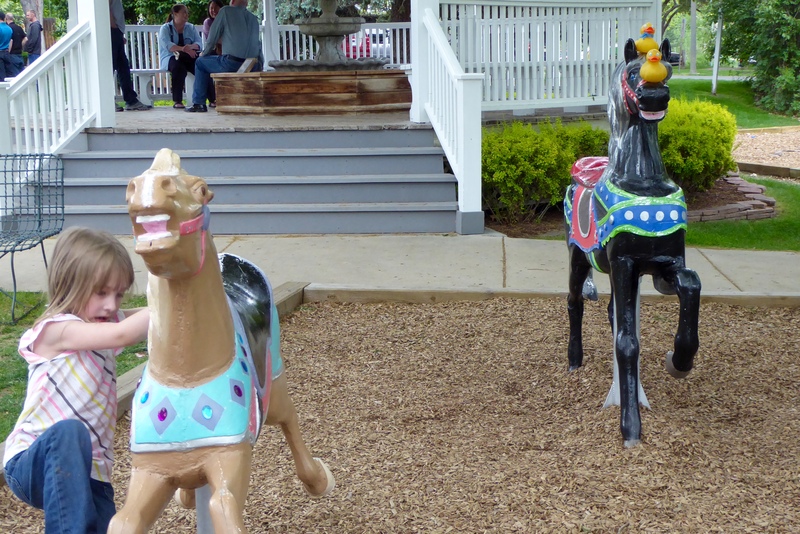 There is so much to do, inside and outside, so it is always a good day to go to the White Fence Farm. 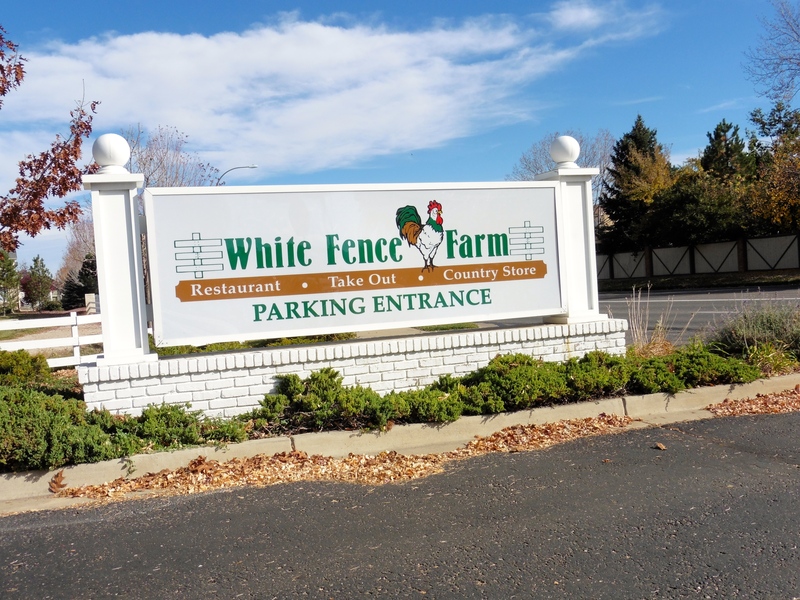 When you are in the Denver area, don’t miss the White Fence Farm. You will love it. 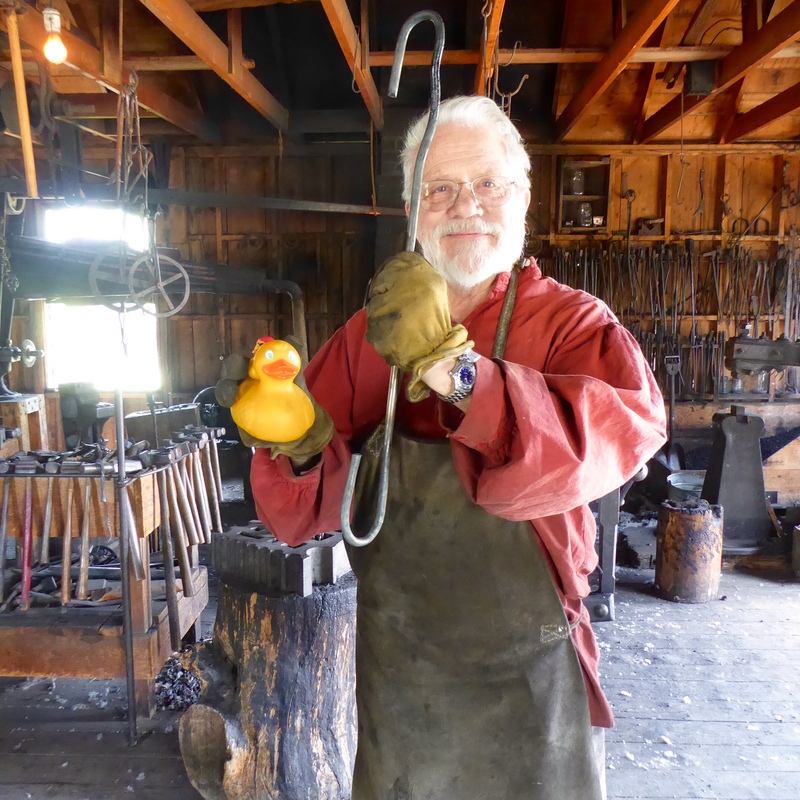 Zeb and Lagertha Duck are happy to return to the Littleton Museum. 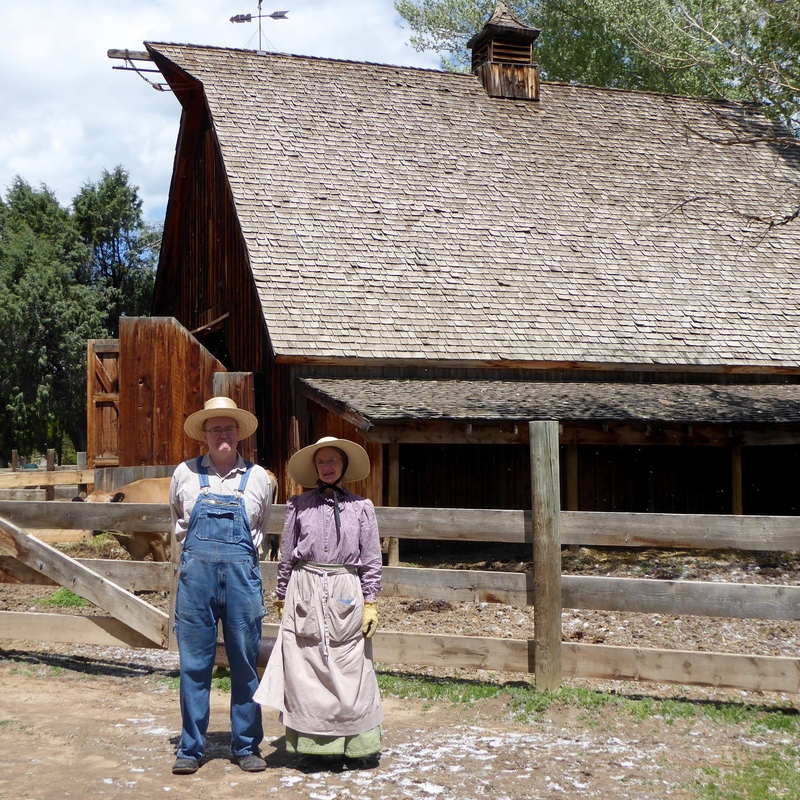 We want to show you the 1890s Urban Farm today. The main building has an interactive area for young people, an art gallery and a nice gift shop. 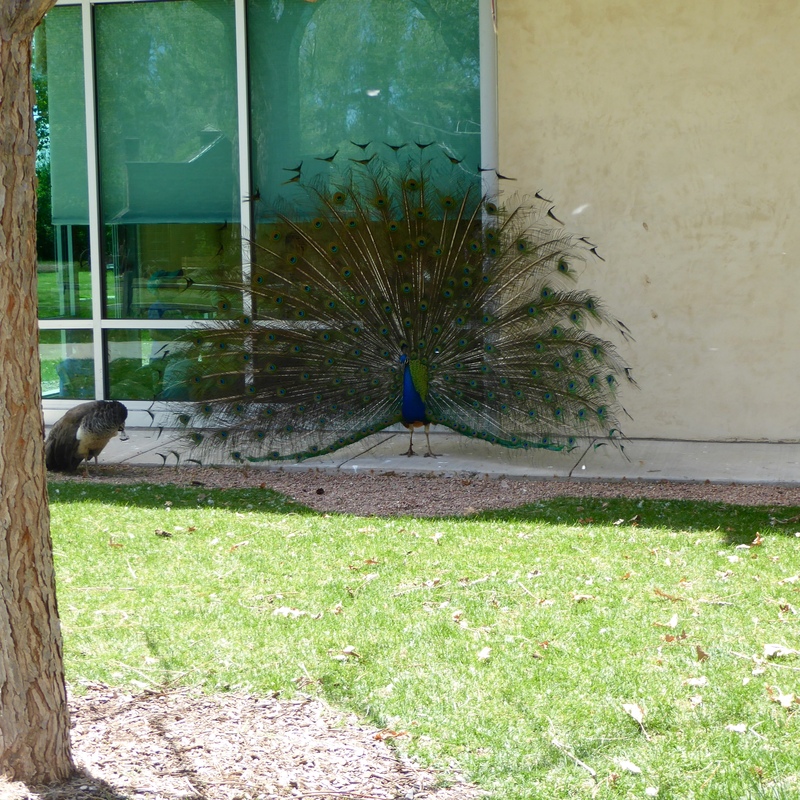 Leaving this main building, we first find this peacock with his feathers fully opened. Isn’t he magnificent? We love him. This couple was returning from the garden heading for home. We love their clothes. Ready to enter the Blacksmith’s Shop, this bat was on the door. 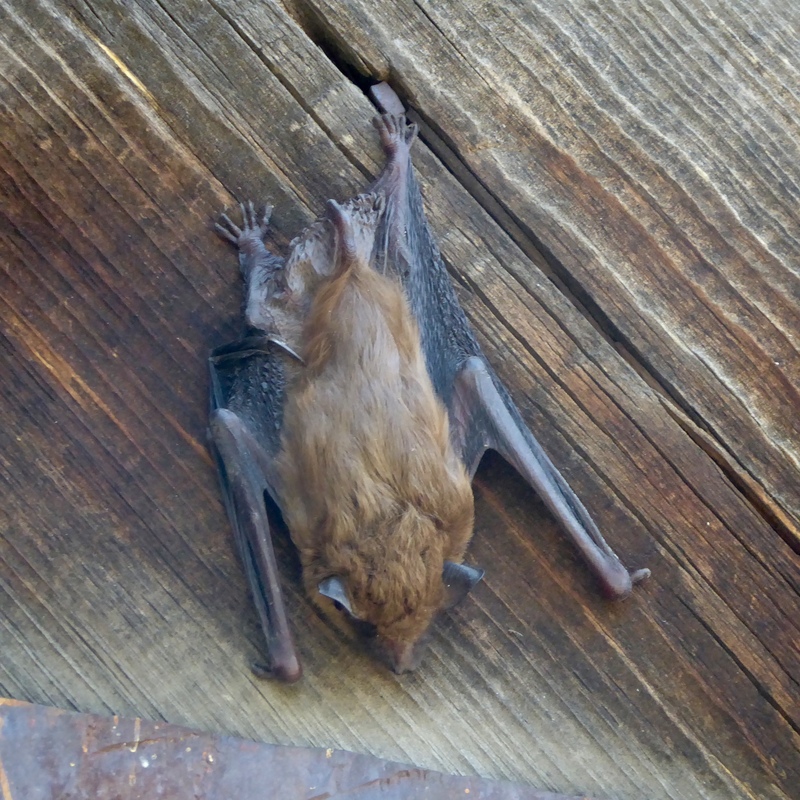 He was hard to see…brown bat on brown door. 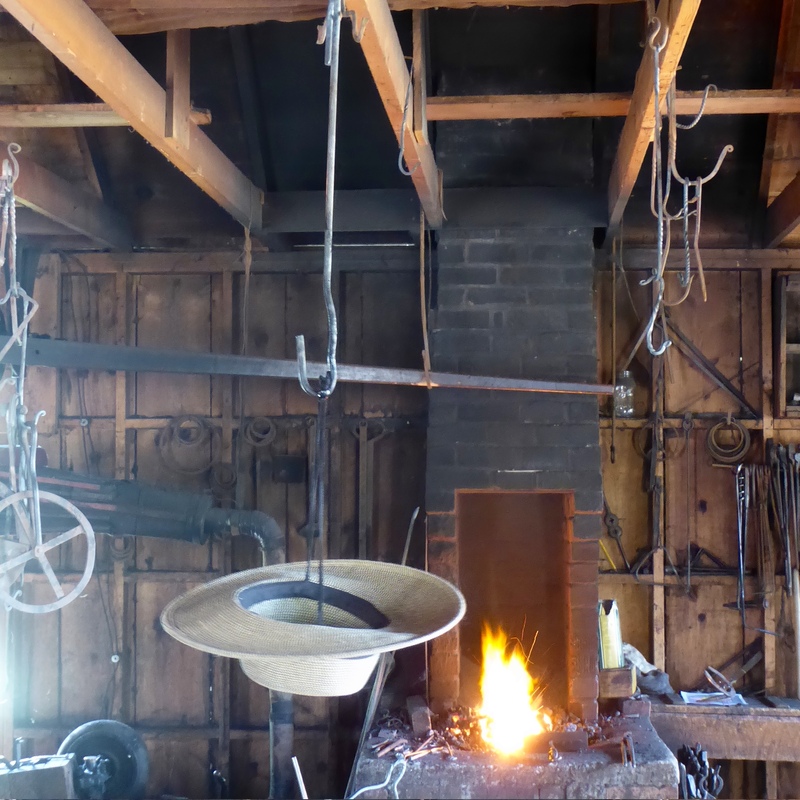 Inside, the Blacksmith showed us how he needed to heat iron in the fire, behind him. 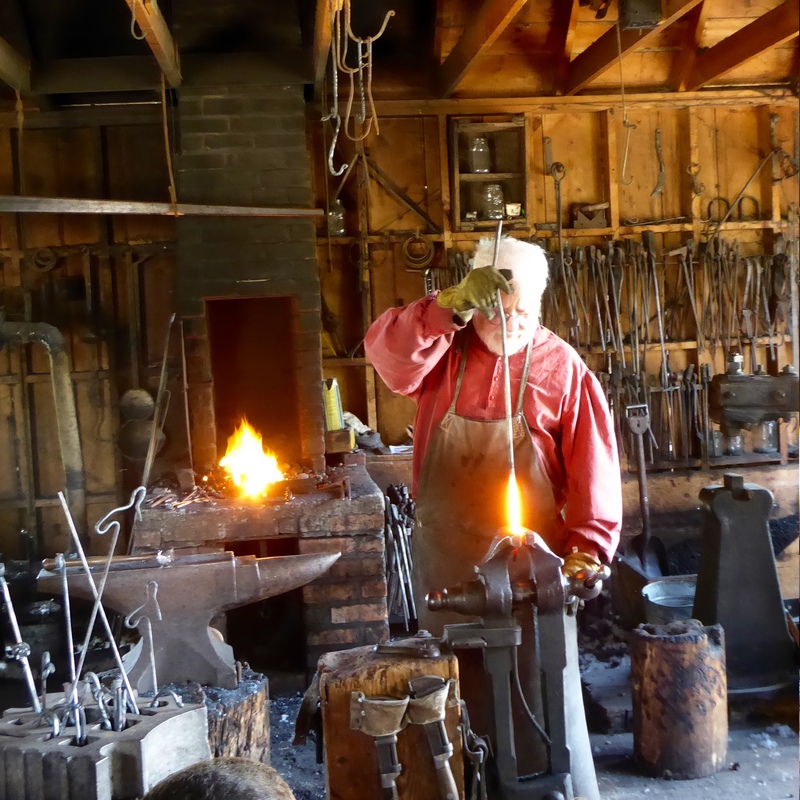 When the iron was hot, he put it in the vise so he could bend the hot iron. Hot metal in vise . After bending the iron the way he wanted it, he plunged the hot iron in a tub of water to cool the metal. With this rod, he bent a hook at each end. Then he showed us this could be useful for hanging things. He put Lagertha’s mom’s hat on the hook. Zeb and Lagertha made another new friend today. 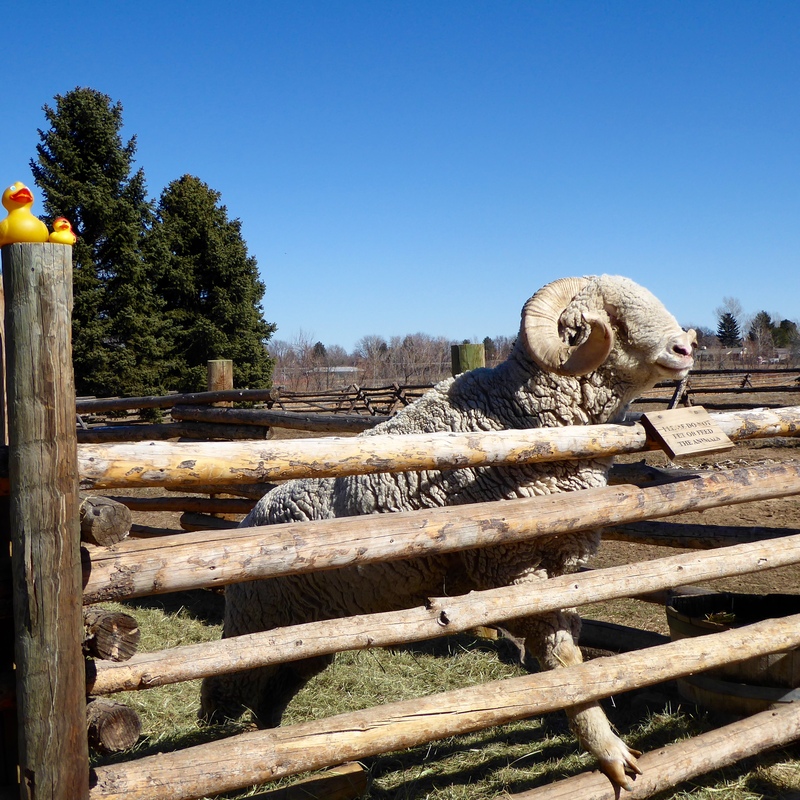 We like him and he likes the Colorado Traveling Ducks. This farm has a nice cow. Isn’t that a great windmill in the background? 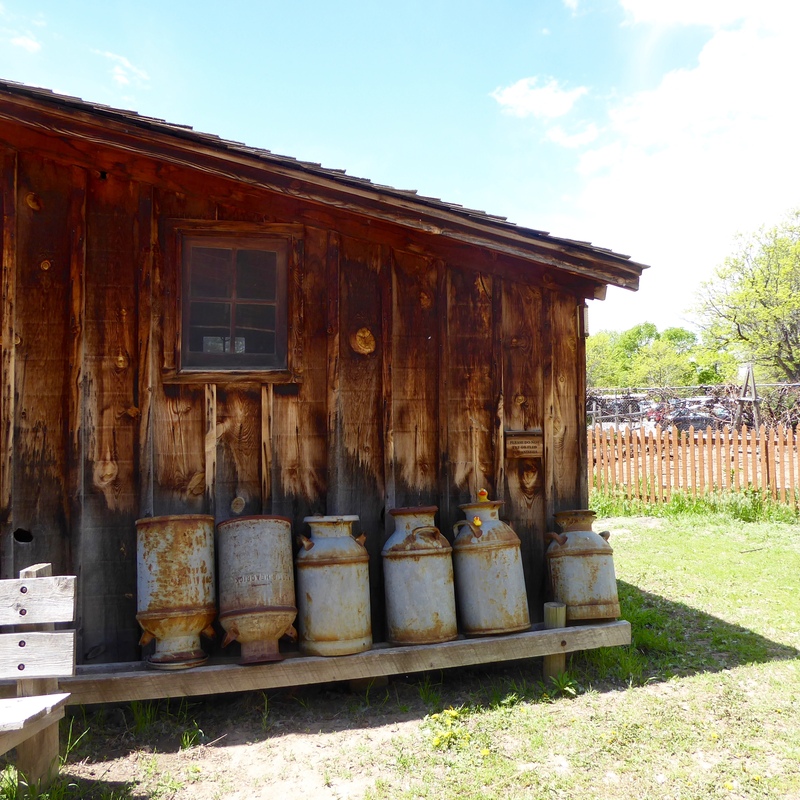 Passing a storage shed, we liked these milk cans. They are rather comfortable for ducks. The farmer’s house is very nice. This stove is a little different than ours. Remember there is no electricity, so the part we are sitting on holds the wood. When the wood is burning, the heat goes into the oven and also causes the stove top burners to heat. This is really nice. But our moms say they like todays gas and electric stoves better for cooking. The dining room looks nice. Mom especially likes the glass china cabinet. You can see people in the living room, playing the piano. Here we are on a small table. 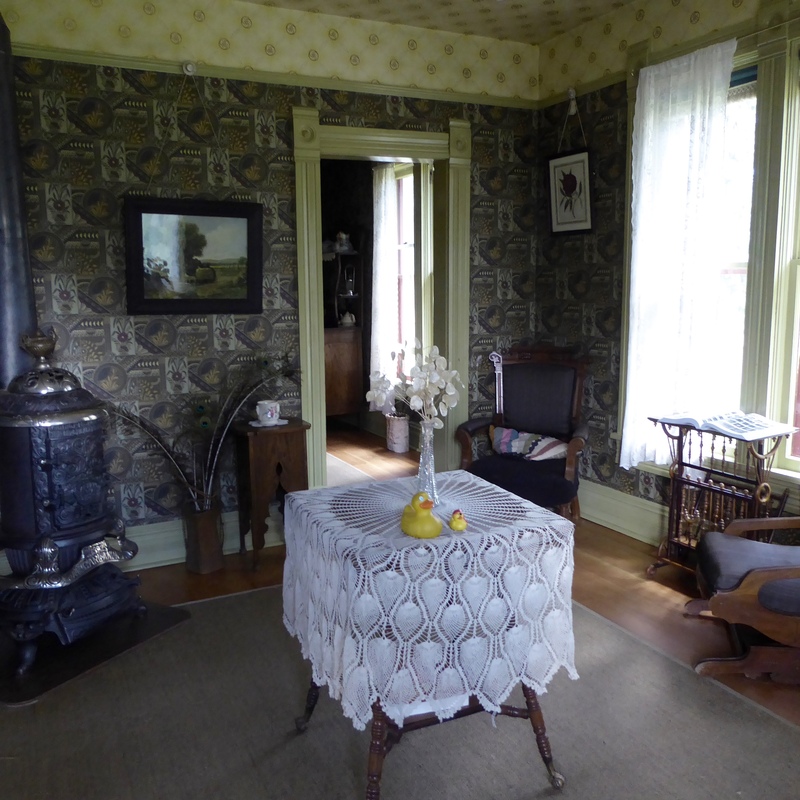 Notice the wood burning stove here. This was the source of heat for part of the house. 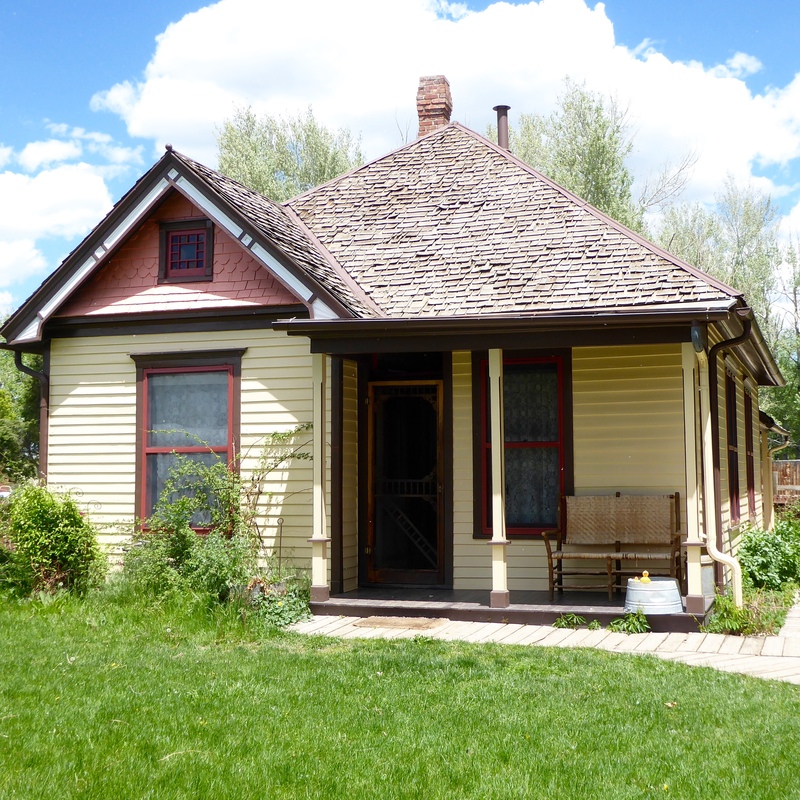 We hope you will visit the Littleton Museum. It is one of the top 10 local history museums in the United States. It is also one of 700 museums to be fully accredited by the American Association of Museums. 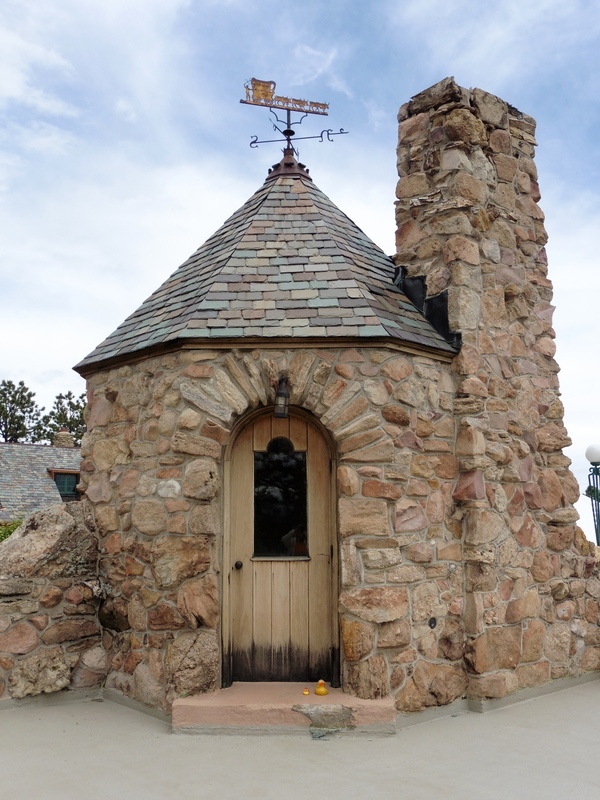 And perhaps the most impressive statistic, the Littleton Museum is one of 140 members of the Smithsonian affiliates. What a great museum. 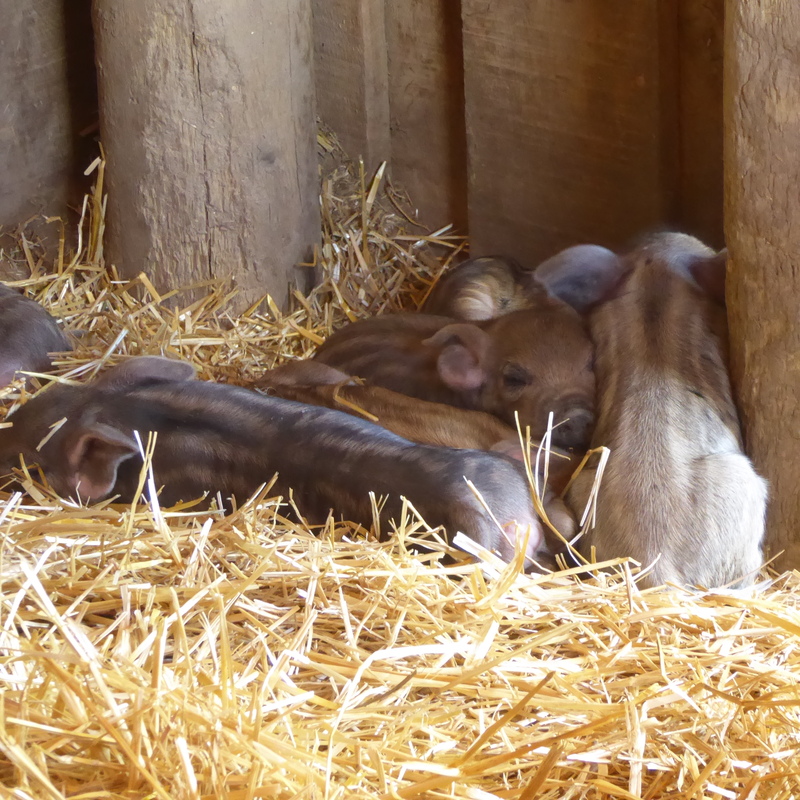 Yesterday we showed you the new piglets on the farm. 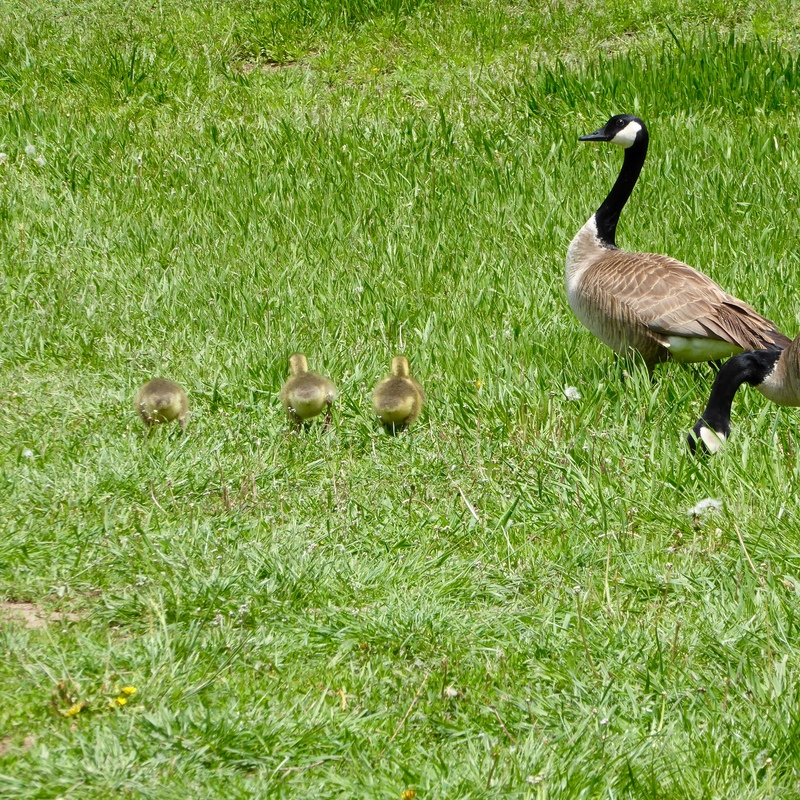 Today we want to show you the baby geese. We just love baby animals. There is so much more to see on each farm. 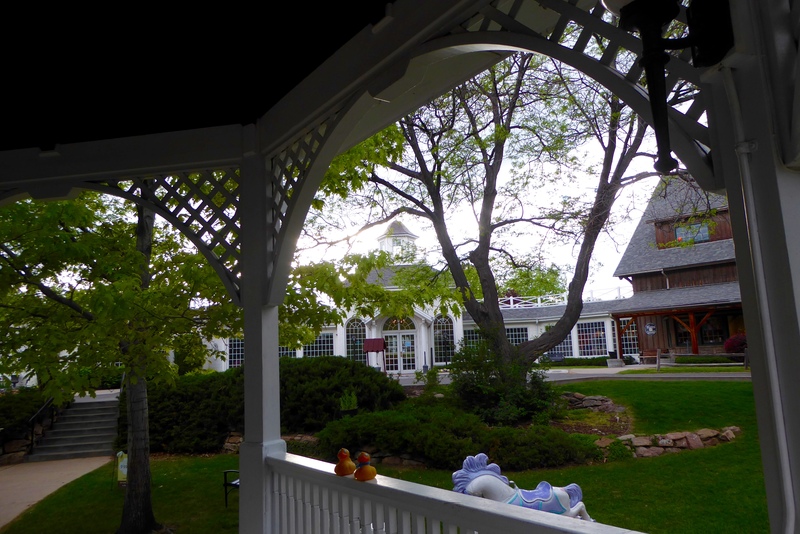 We hope to see you at the Littleton Museum soon. Zeb and Lagertha are exploring a farm from the 1860s today. 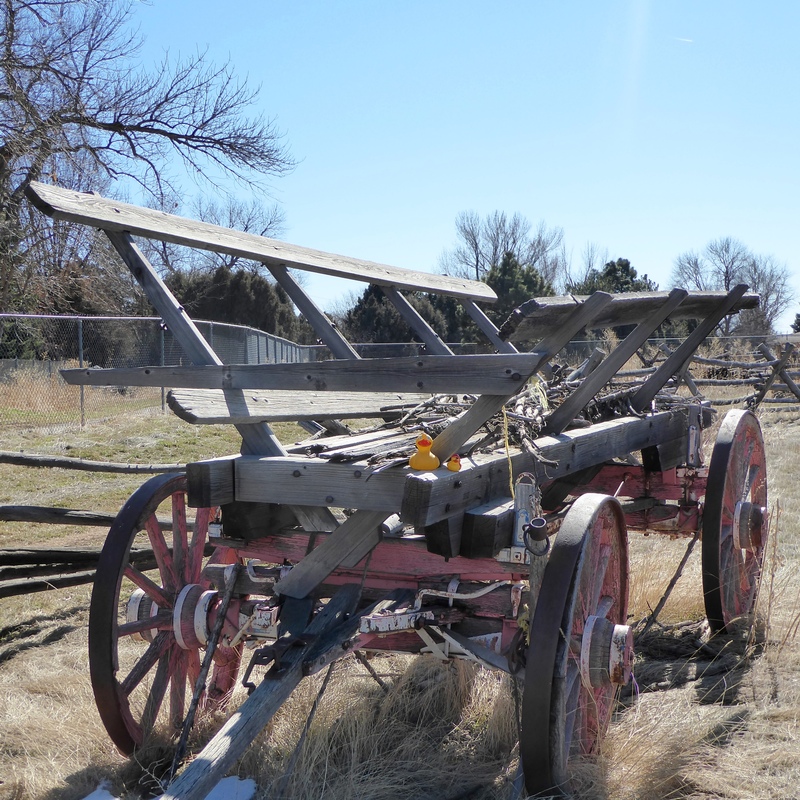 The Littleton Museum in Littleton, Colorado is a great place to visit. First let’s head to the school. Notice the box against the right side of the building. This is for firewood. 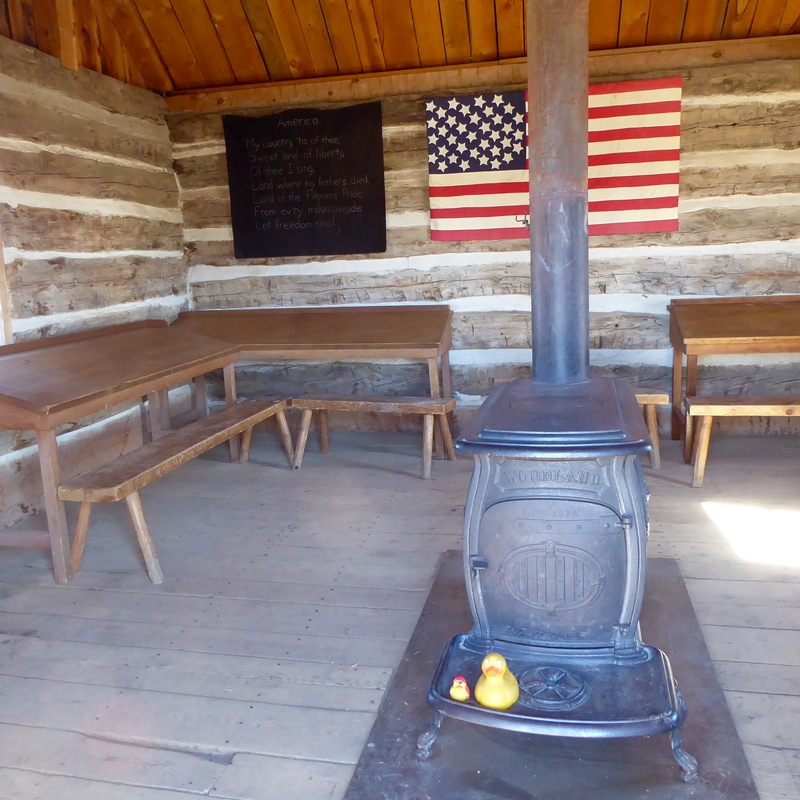 Inside the school house. Heat supplied from a wood burning stove. 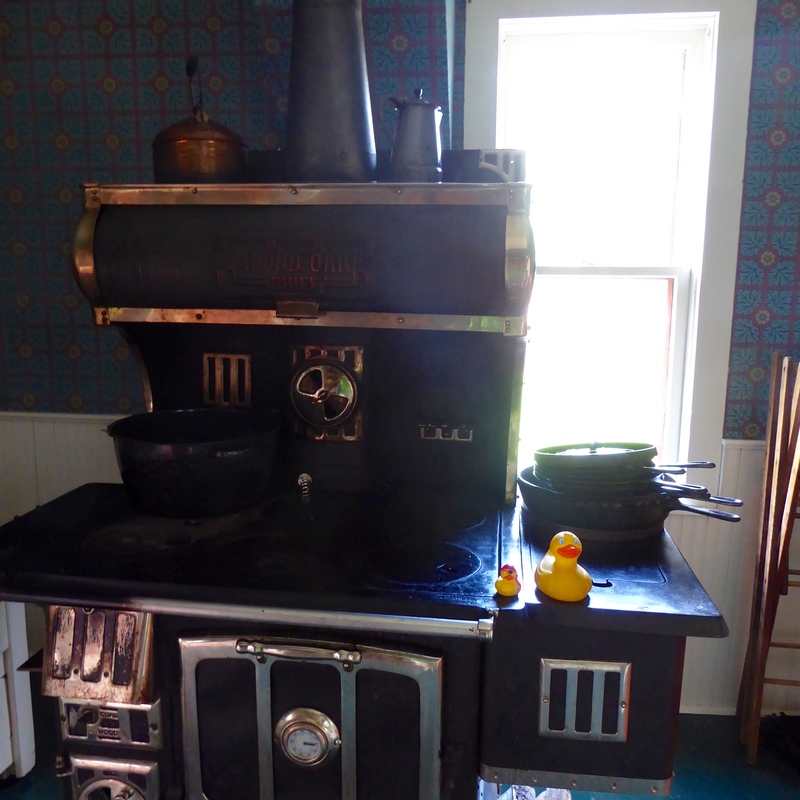 I, Zeb the Duck and my friend Lagertha Duck went inside and we are sitting on the stove. It is warm today, so there is no fire to singe our feathers. And, every school needs a teacher. Teachers had to dress up every day to teach the children. Look at these benches. Straw is fun for sitting. 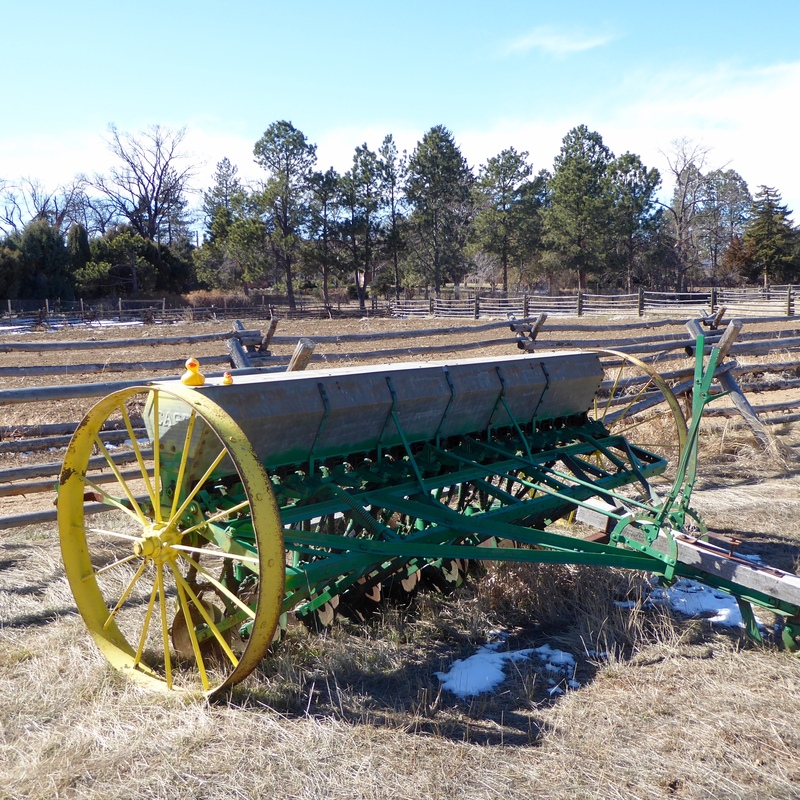 Our farm has some of the old farm equipment. We like this stuff, but we really don’t know how to use it. But it is great to see. 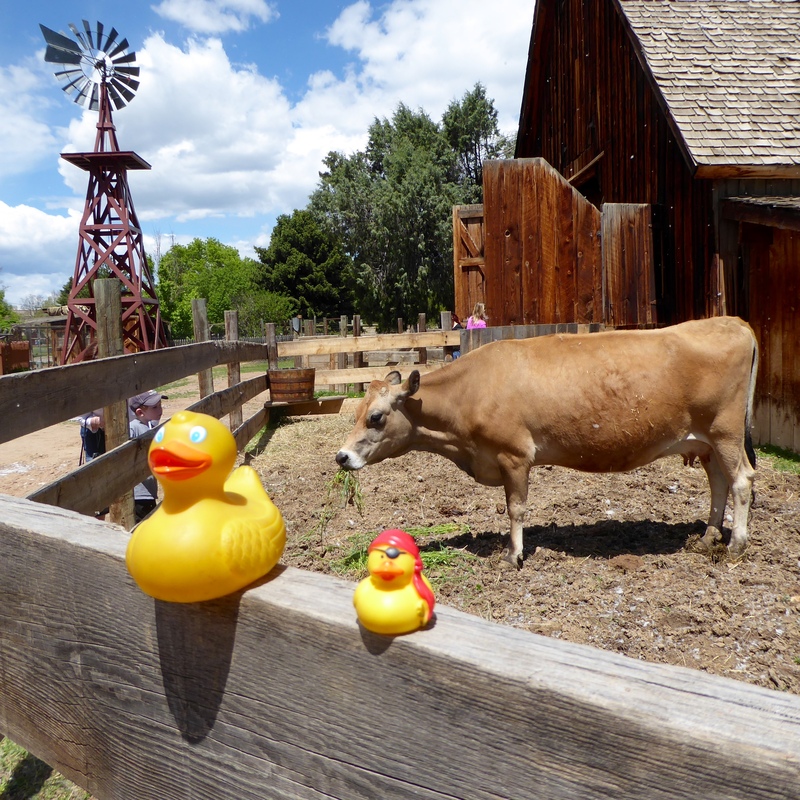 The Littleton Museum has 2 farms. 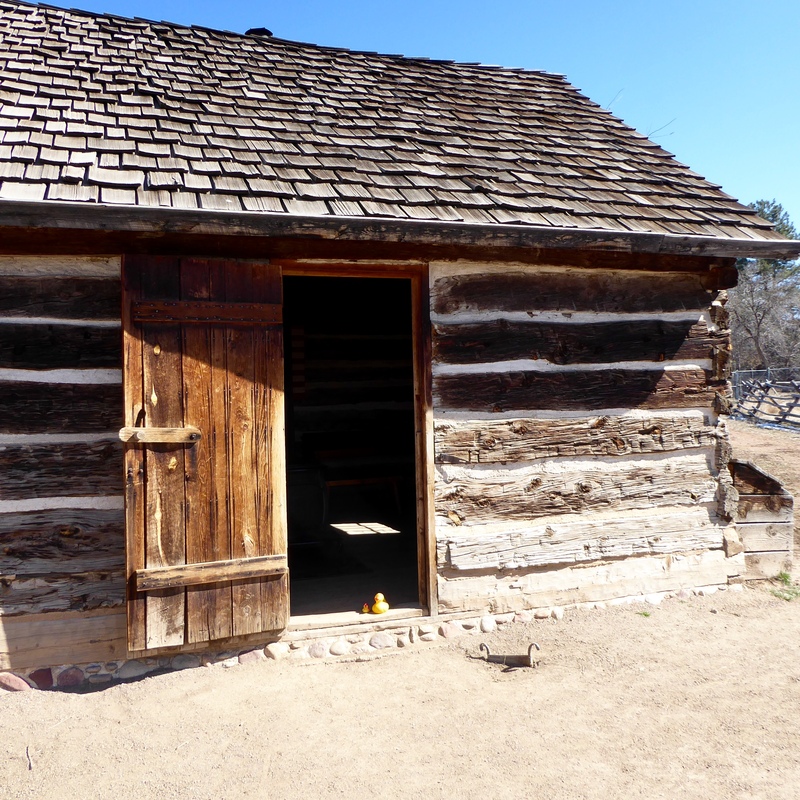 This is the 1860s Homestead Farm. 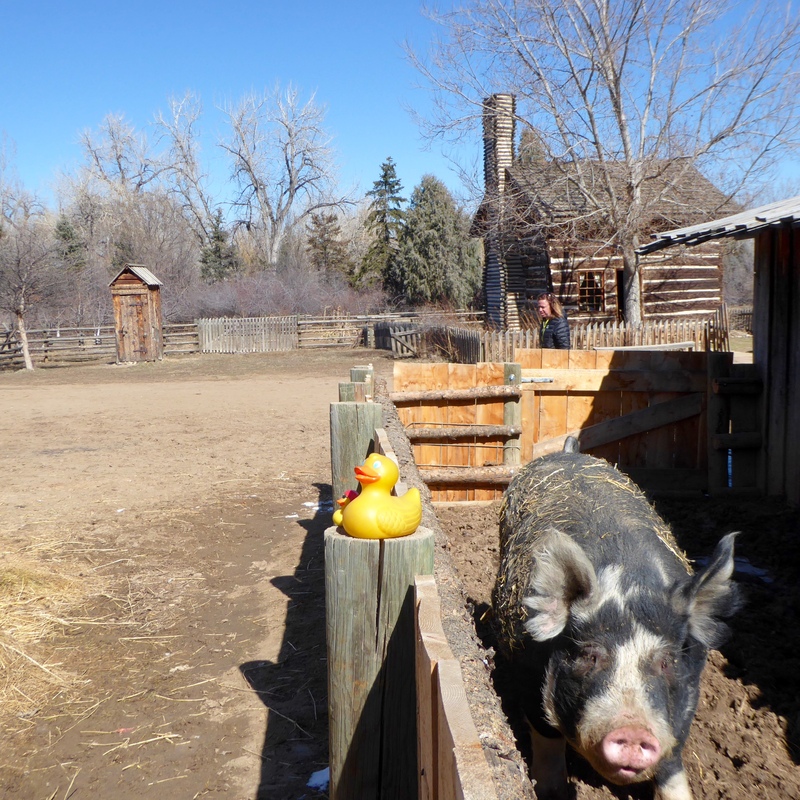 The other farm, for another day, is the 1890’s Urban Farm. The museum has about 39.5 aces and is adjacent to Ketrig Lake. We love the animals on this farm. Isn’t this large sheep fantastic. Look at those horns. She is even resting her foot on the rail. 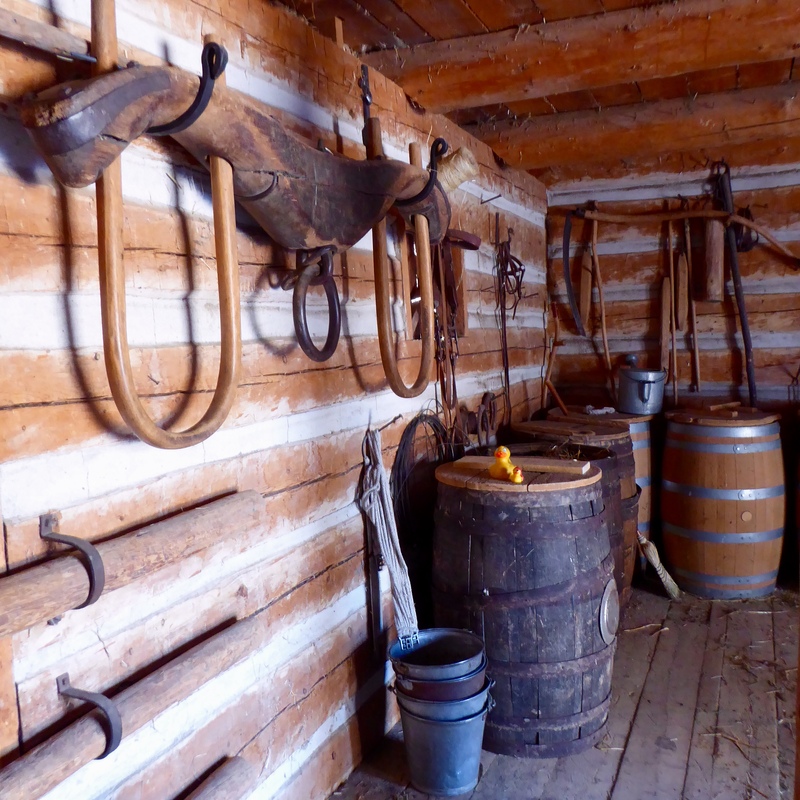 In the 1860’s farmers had cellars. 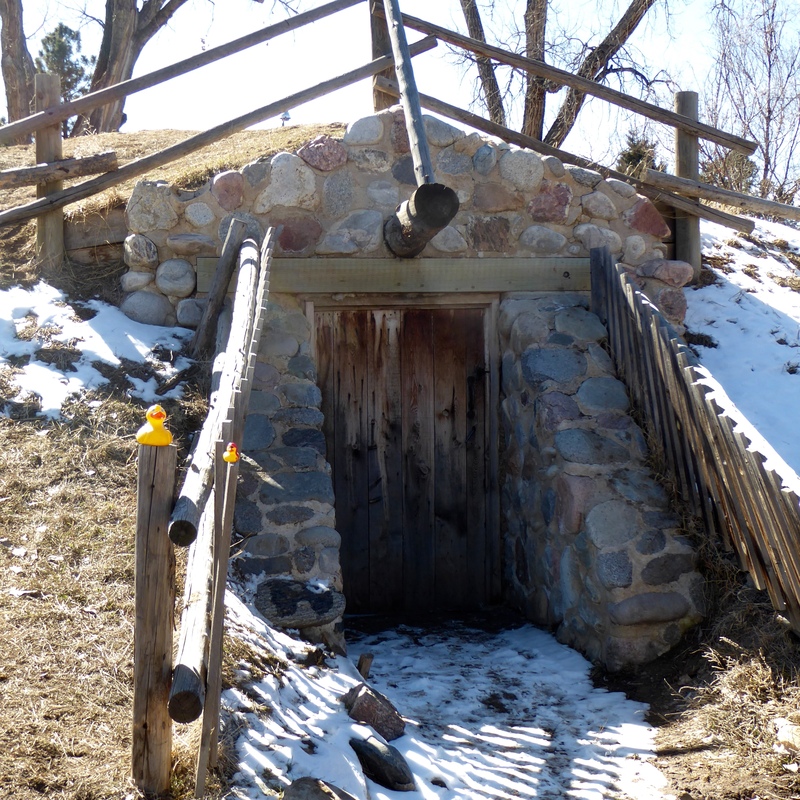 This is that magic, cool, dry place to store some root crops for winter meals. 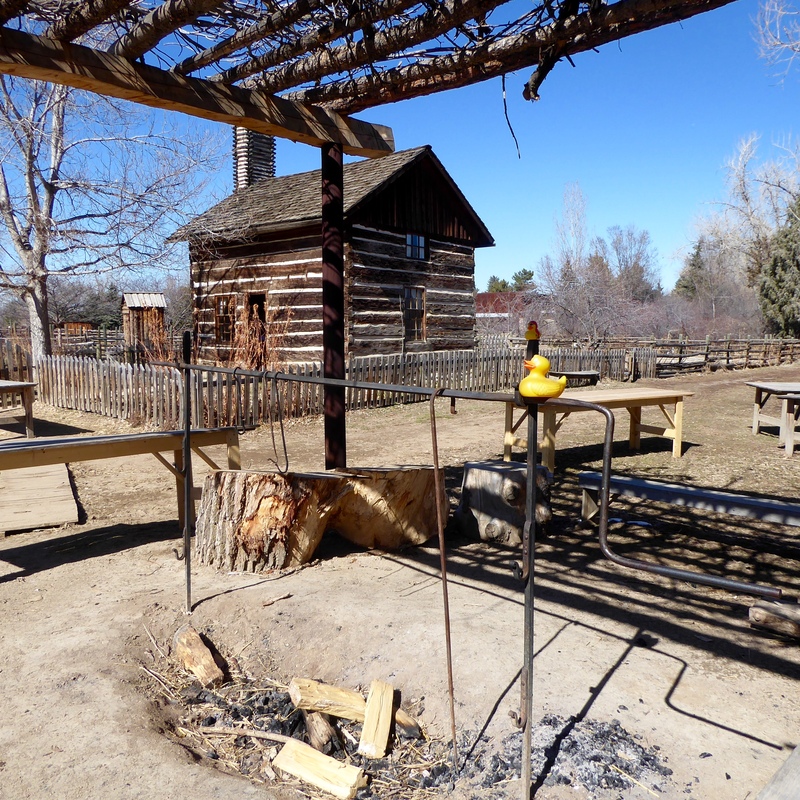 Often meals were cooked outside over a fire. Fire pit and spit for outdoor cooking. Don’t cook us! Here Zeb and Lagertha are on the spit, expecting not to be cooked for dinner. Don’t worry ducks, you are safe with us. To maintain a farm, may tools are needed. This tool shed holds many tools that were used by hand. 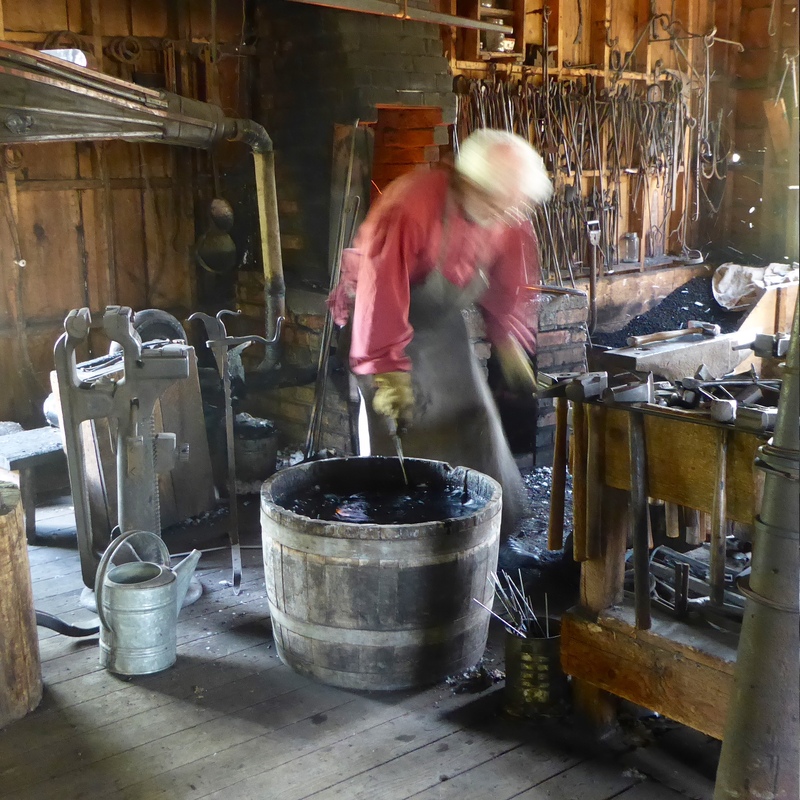 There were no electric tools in the 1860s. More animals. This pig is huge. Time to leave mom? This pig is huge, but we think she likes us. At least we hope she likes us. Here are the new piglets. They are adorable, like all new babies. The settler’s house was very welcoming. And all without electricity. There were many animals on this farm, but this is one of my favorite, Lagertha and an ox. This museum is great, and it is even free. 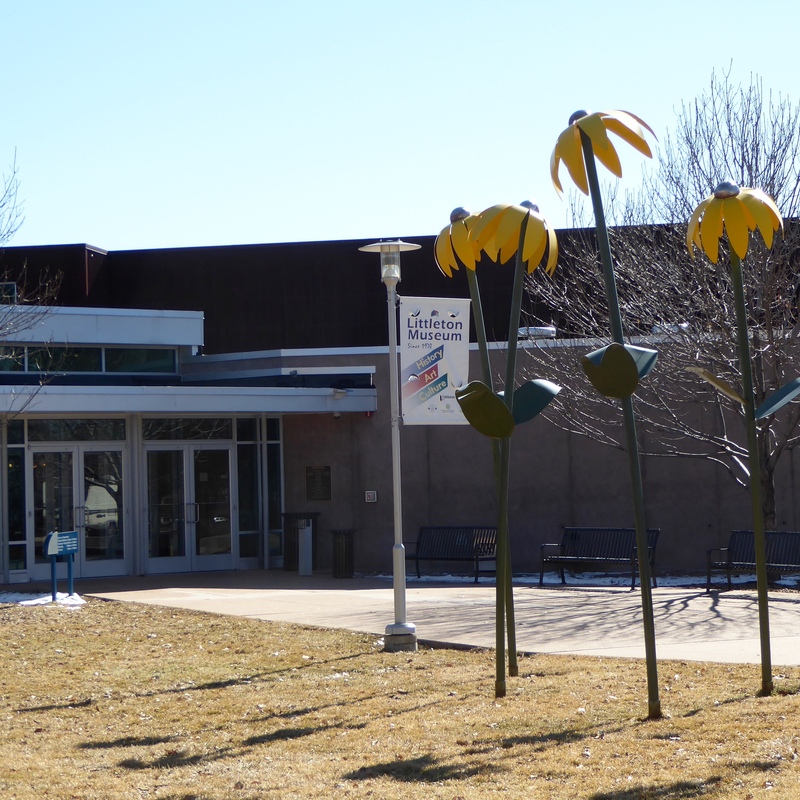 For more information visit http://www.LittletonGov.org Then click on Departments at the top of the page and then click on museum in the drop down menu. 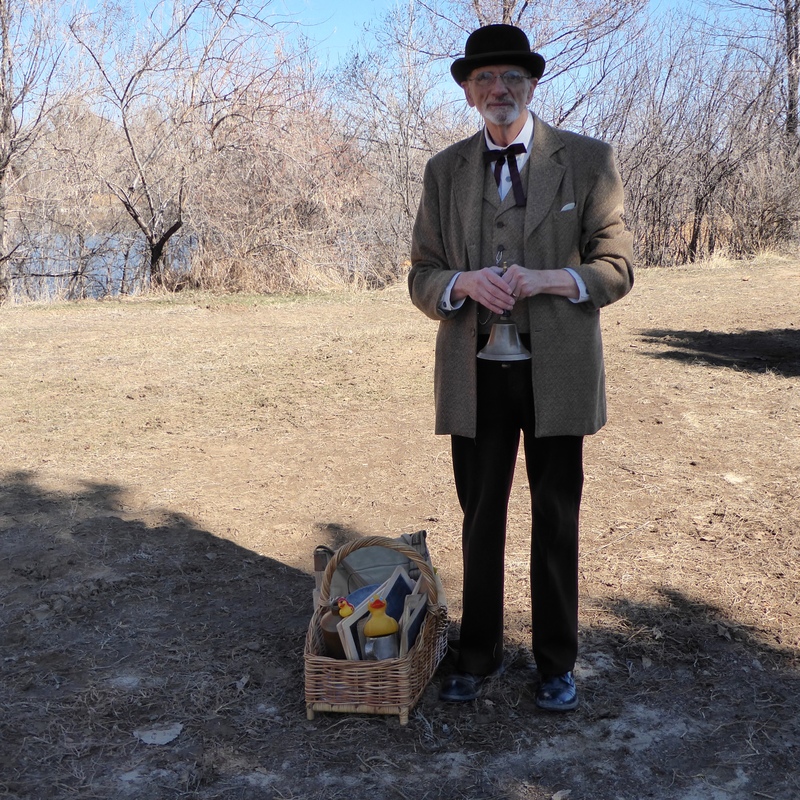 Next time we will show you the 1890s Urban Farm. You will enjoy this museum if you visit it. 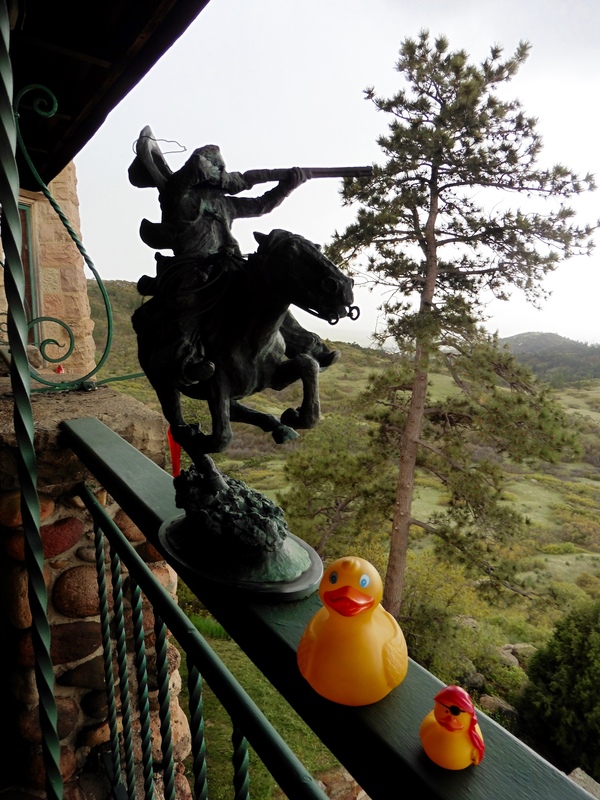 My friend, Channel the Bear, sent photos to me, Zeb the Duck. Channel and her mom just returned from a couple weeks in Cuba. 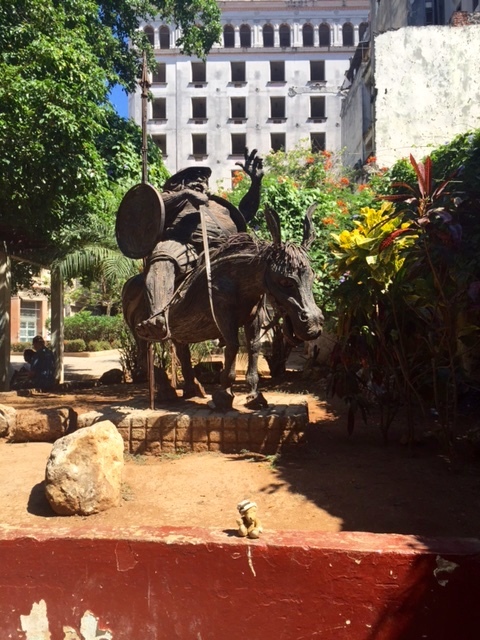 Havana, Cuba has great statues. Here Channel found a friendly arm for a temporary resting place. 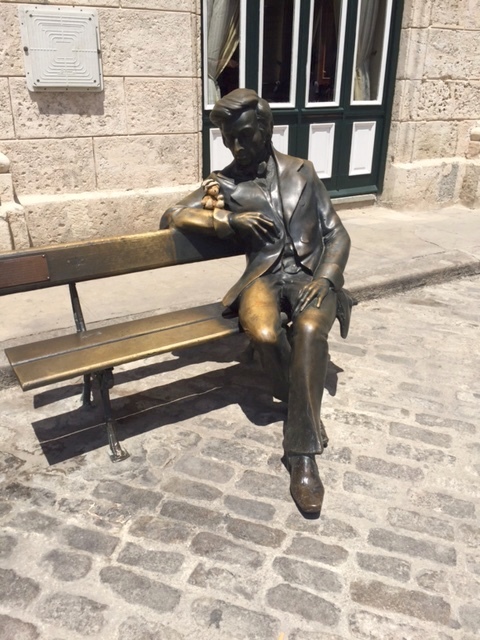 The shiny leg indicates that others also found this statue to be a good stopping place. This statue makes us all smile. This is Sancho Panza from the famous story of Don Quixote. We like this statue and Channel just makes the photos great. Here my friend, Channel, is sitting on a window ledge. She looks so Cuban. We love it. 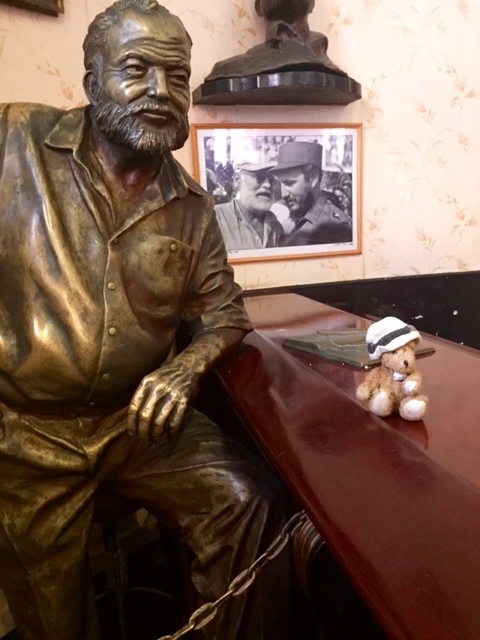 After a day of exploring Old Havana, humans and bears get hungry and thirsty. Channel and her mom are in El Floridita, one of Havana’s historic and favorite restaurants. This restaurant first opened in 1817. In 1914 Constantino Ribalaigua Vert began working here. By 1918 he was the owner. But most important, in the early 1930s, as a bartender, he is credited with inventing the frozen daiquiri. Channel, I hope you and your mom tried one of these famous beverages. My mom tells me they are really tasty and refreshing. But humans should not have too many of them at one time. 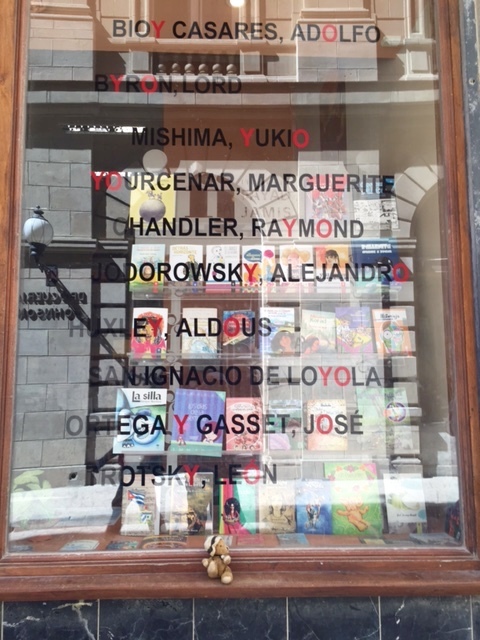 When Ernest Hemingway was in Cuba, this restaurant was a favorite hangout of his. Maybe he came here just to see Channel? Thanks for the photos, Channel. They remind us of the great time we had in Cuba with you a few years ago. We think it is great that your mom is a tour director and you go there often. Thanks Channel. 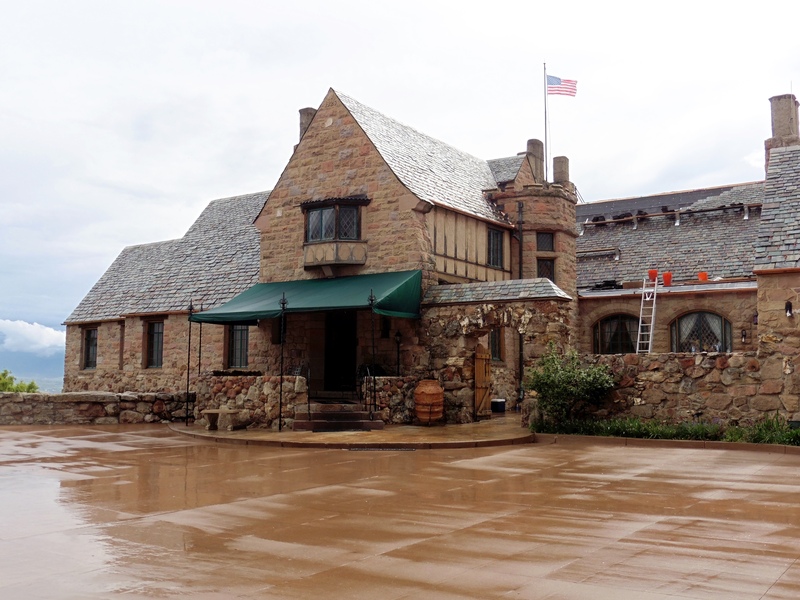 A 1450s style Scottish Castle is only 30 minutes south of Denver, in Sedalia, Colorado. 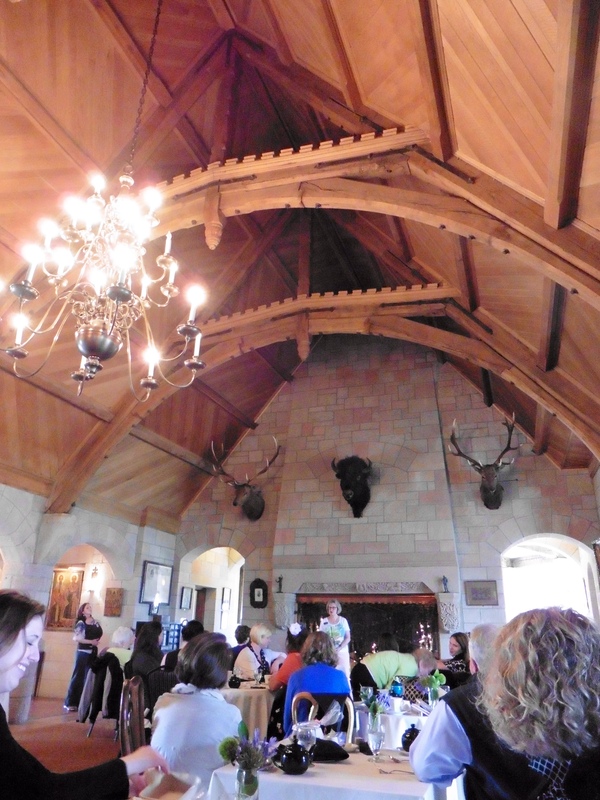 Surrounded by 3,400 acres of ranch land this castle is breathtaking. Owned by Mildred Montague Genevieve Kimball, known as Tweet Kimball the property is now part of a foundation and a protected wildlife sanctuary. Tweet was the first rancher, male or female, to introduce Santa Gertrudis cattle from South Texas. These cattle not only survived, but they thrived and are now bred all over the world. Let’s see this castle. Looking to the side, we see green pastures. Must have a tower. Love the weathervane. 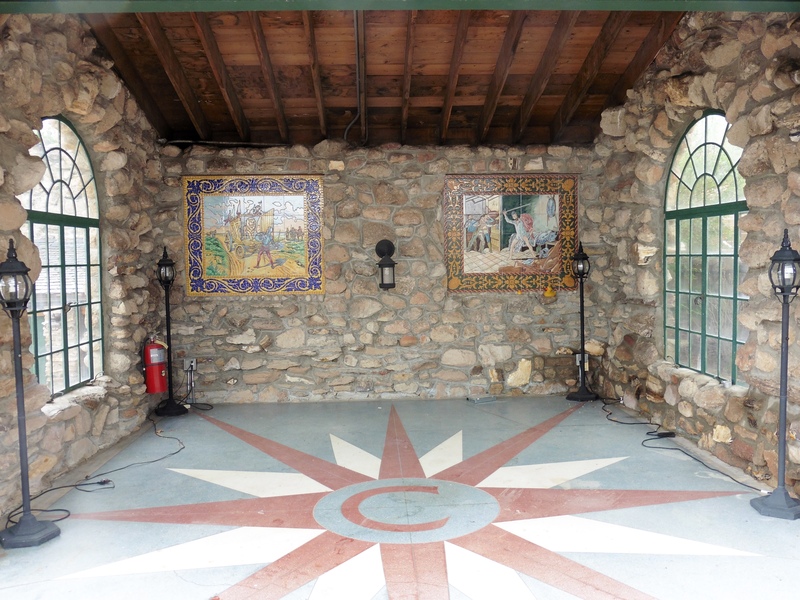 Since the castle is now used for public events, this outdoor area is perfect for parties. 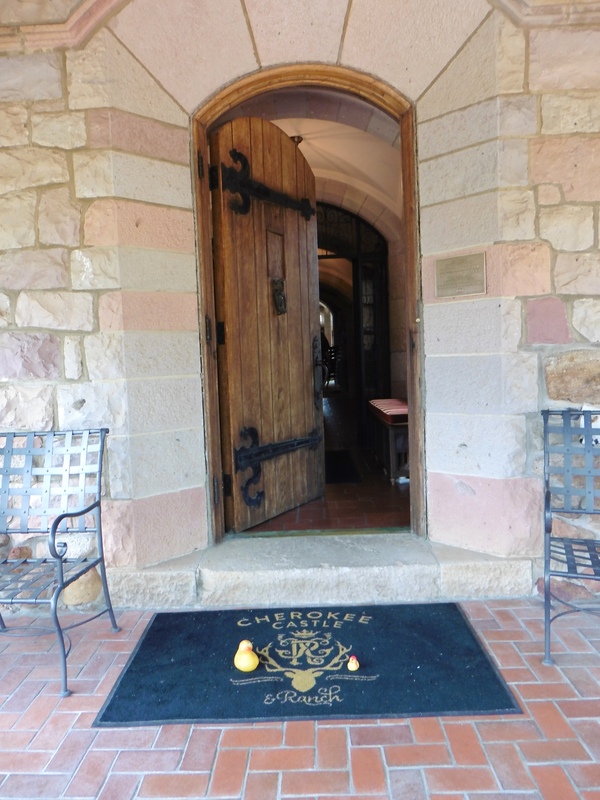 Before opening the door to the castle, we must know who wants to come in. 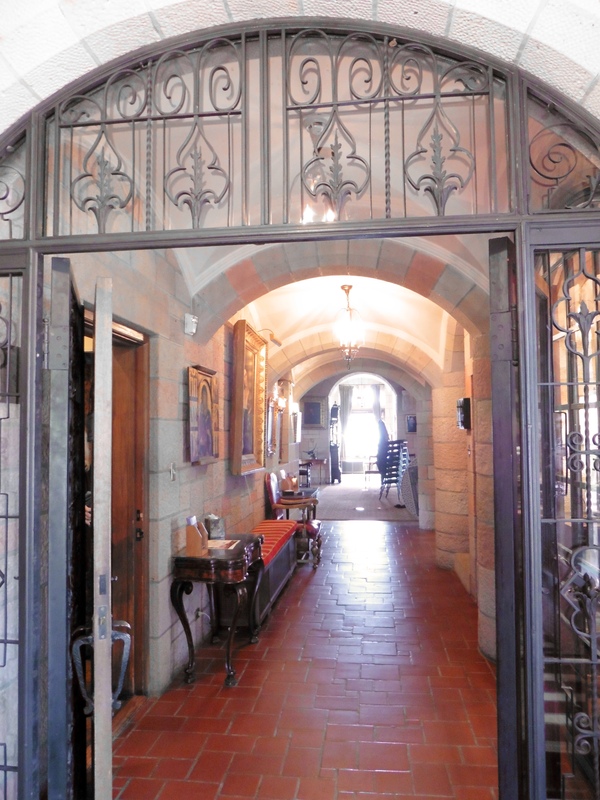 First we enter the Great Hall with soaring wooden arches and cut stone walls. Here is a painting of Tweet as she welcomes us. Today tea is served inside as the weather is a little wet. Isn’t this a beautiful room? 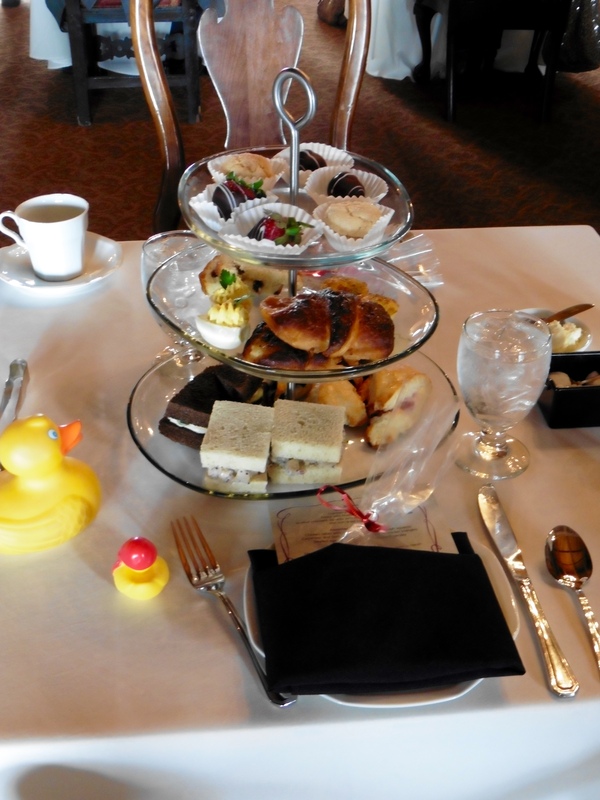 We are served tea, accompanied by a tray of finger sandwiches and sweets. Yum! Everything tasted so good. 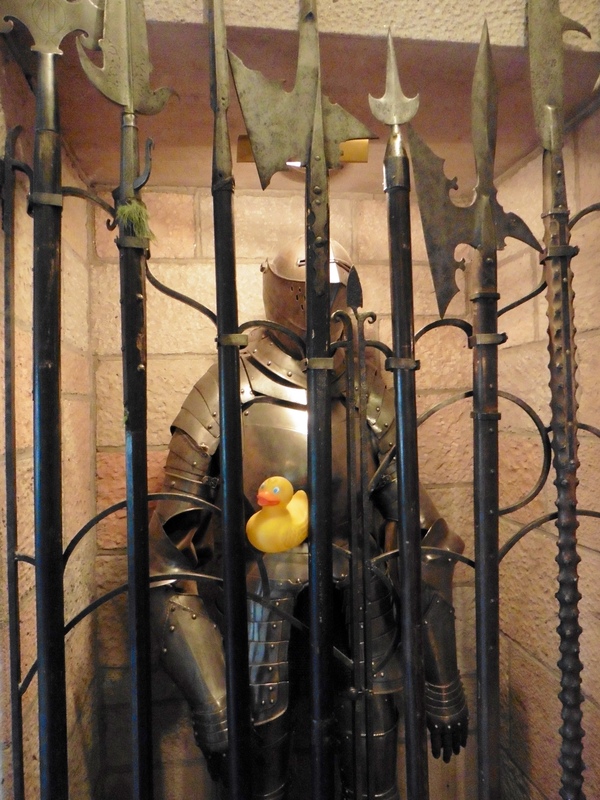 Next Lagertha Duck and I, Zeb the Duck, with the humans marveled at everything on a tour of the castle. Every castle needs a knight with a suit of armor. There is great art everywhere. 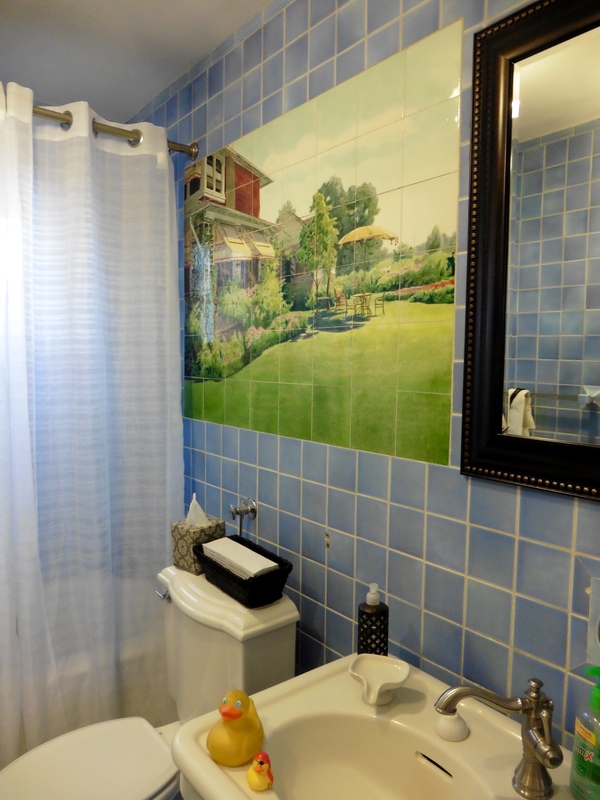 Even the restroom has art. Art in the restroom. Fantastic! 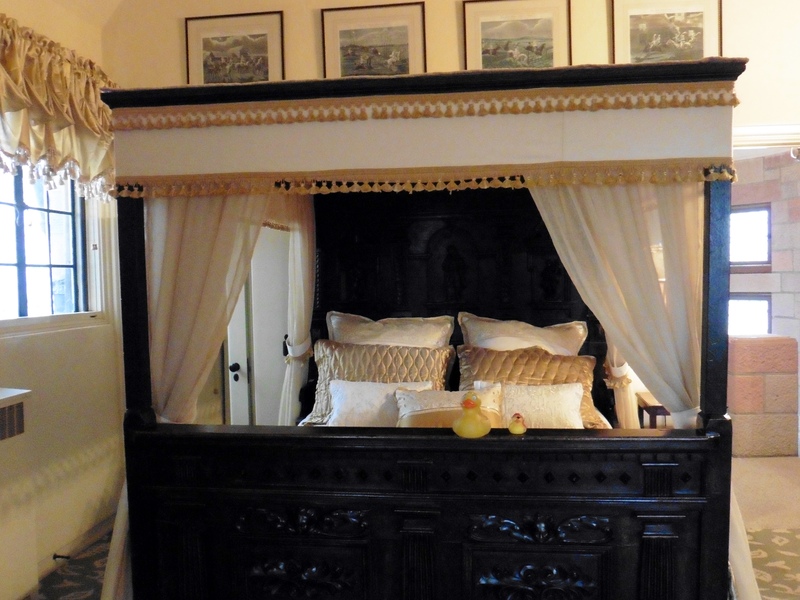 We love this bed. 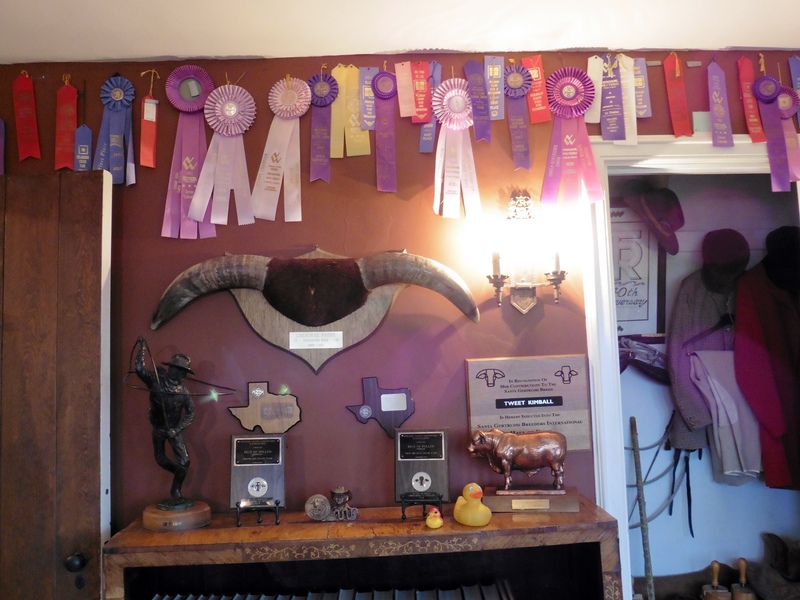 Tweet was a pioneer in the cattle industry and she won many awards. 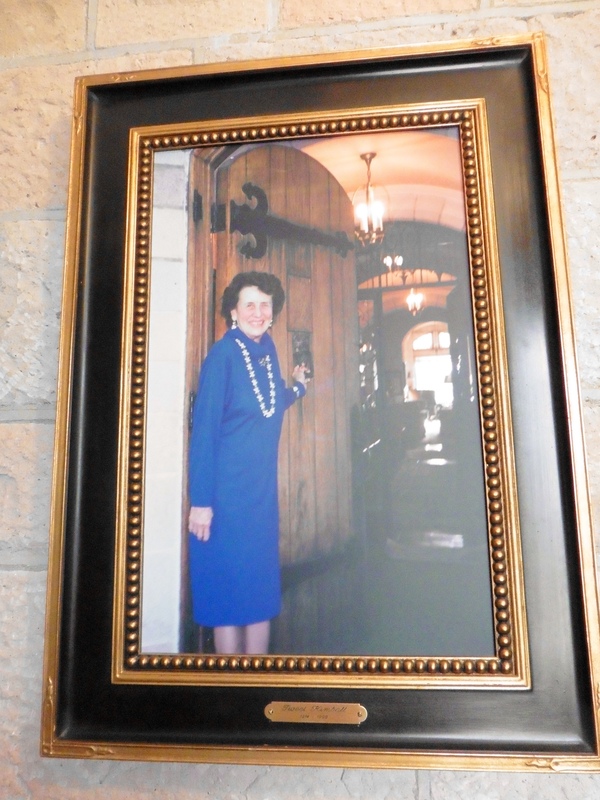 She and her Santa Gertrudis cattle received first place at Denver’s National Western Stock Show for many years. 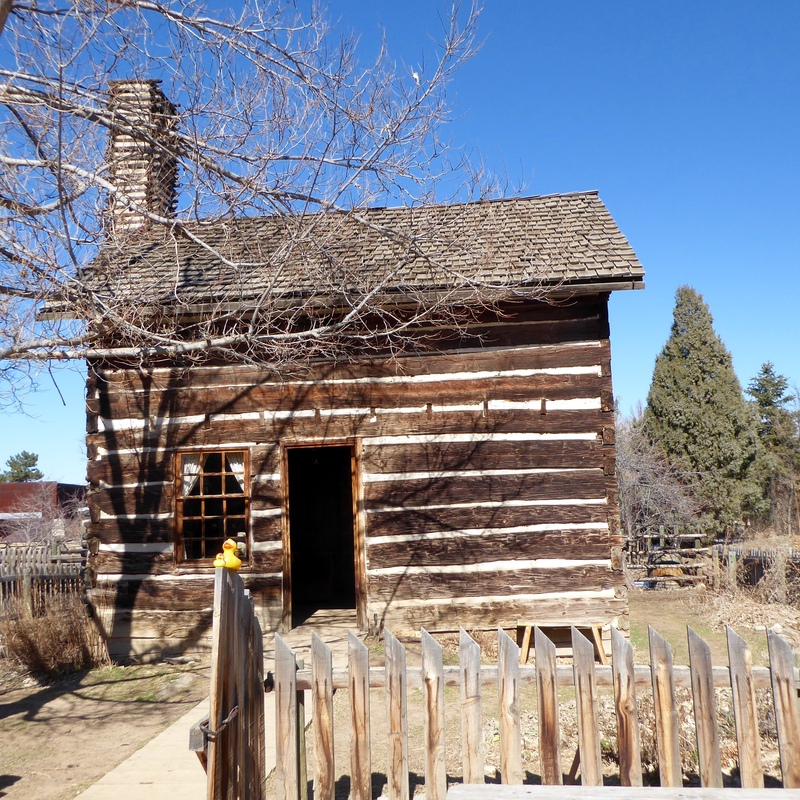 There is so much to see here, you must visit and tour Cherokee Castle when you are in the Denver area. Now we are going to the expansive balcony. This man is balancing on a tight rope. 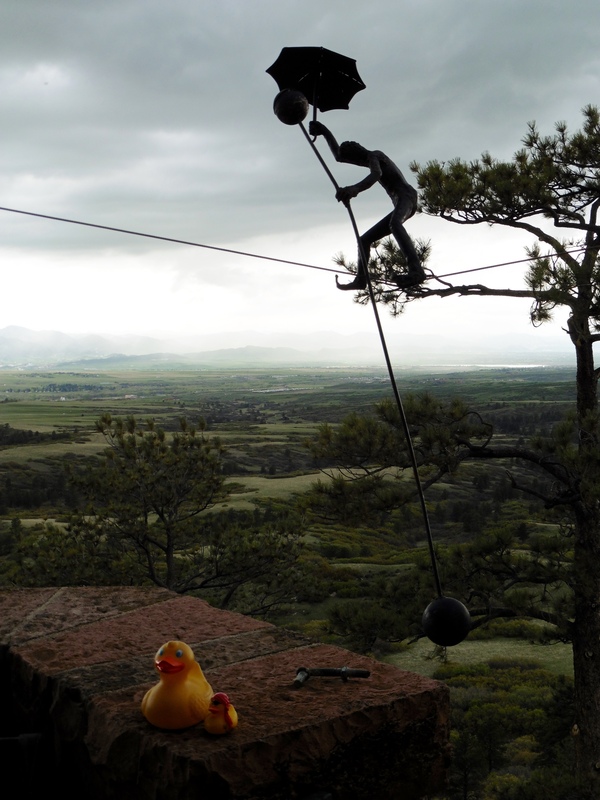 Balancing on a tight rope. Isn’t this incredible! 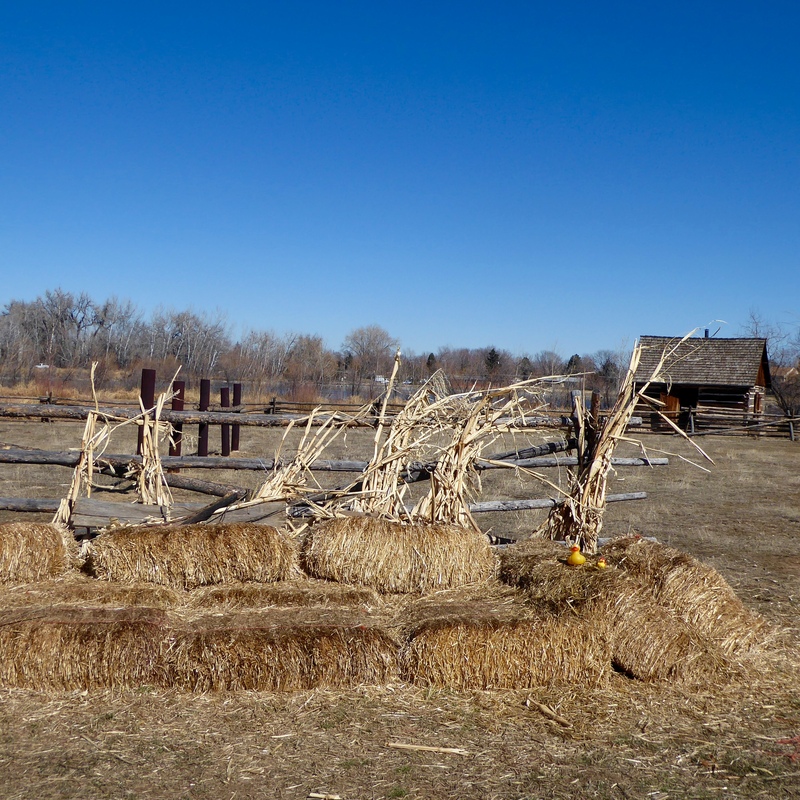 And here is a tribute to the real Denver Frontiersmen. You can see that the weather is not allowing the 200 mile view of the Rocky Mountains today. Cloudy view of the Rocky Mountains. On a clear day you can see Pike’s Peak in the south to Long’s Peak in the north and beyond. One of the most impressive views of our Rocky Mountains. 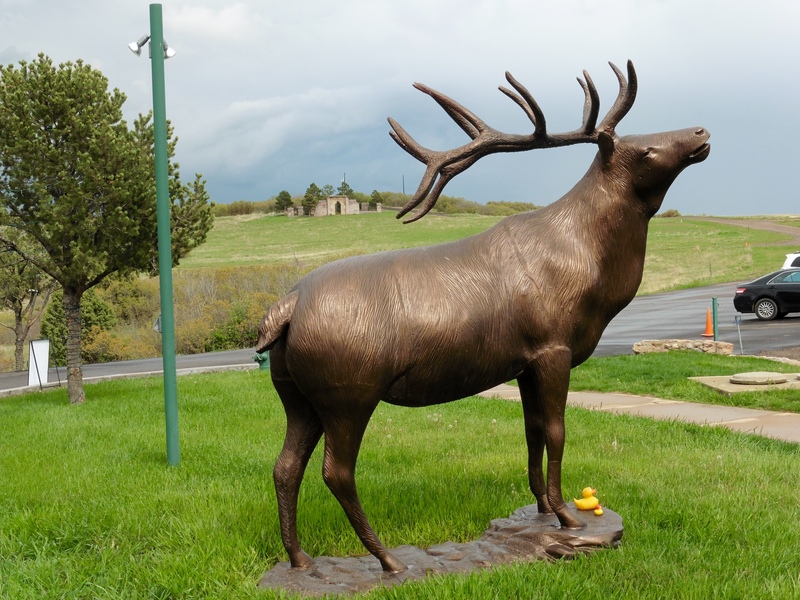 Leaving Cherokee Castle, we admired the huge statue of this elk near the castle. 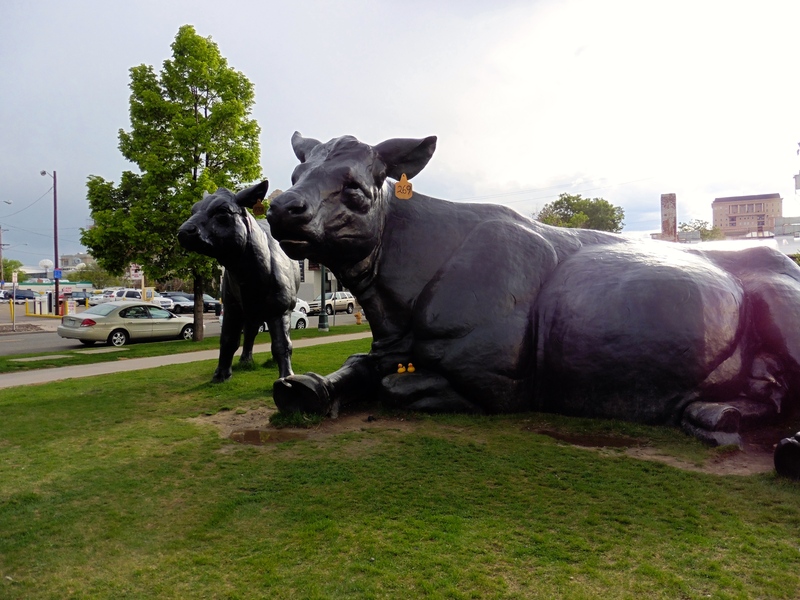 And, perhaps the most important statue, the Santa Gertrudis cattle. 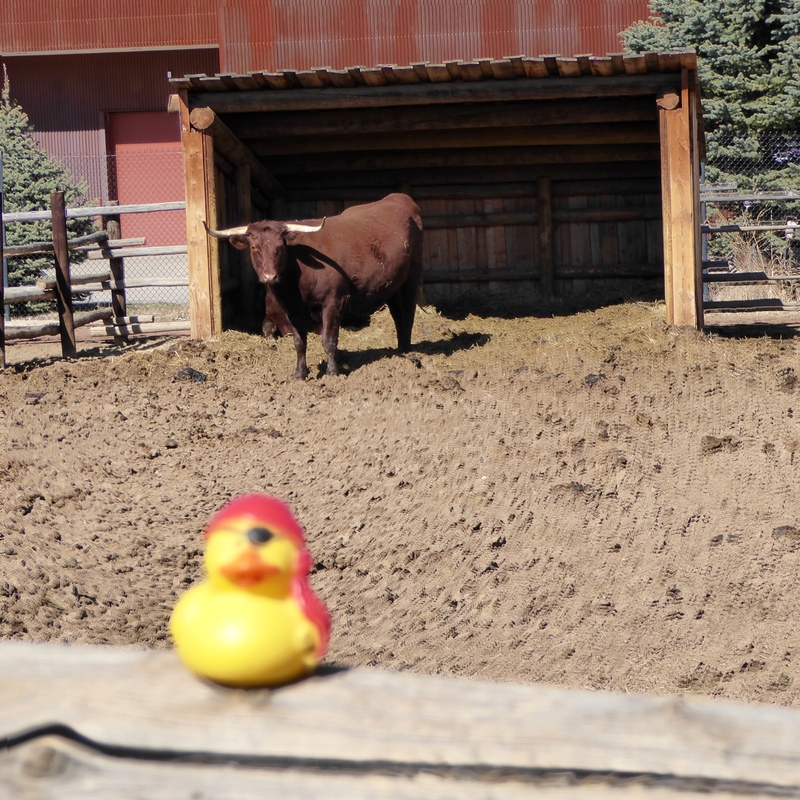 Remember, it was the cattle that brought fame and fortune to Tweet and the Cherokee Ranch. For more information visit http://www.CherokeeRanch.net We hope you visit this beautiful place. We loved it.